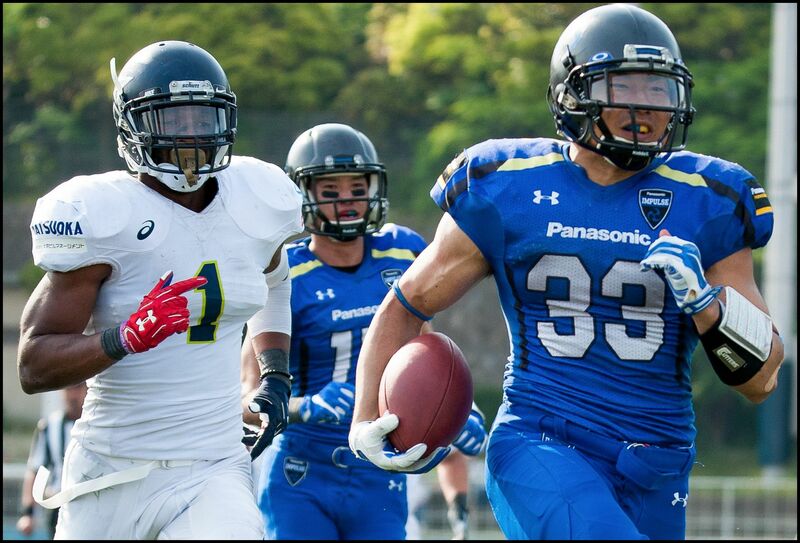 Panasonic Impulse are best in the west. 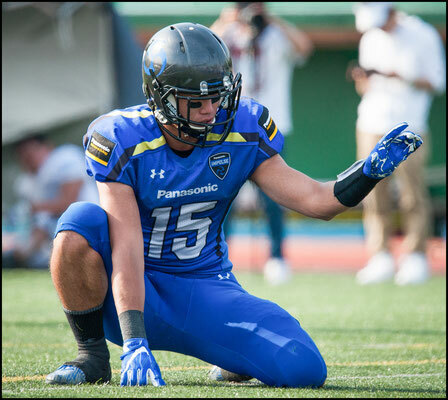 Panasonic easily beat the Elecom Kobe Finies 55-3 in the Green Bowl Championship game - the third year in a row with the same outcome. Despite the lopsided final score, things started out evenly with Elecom’s offense moving the ball well. 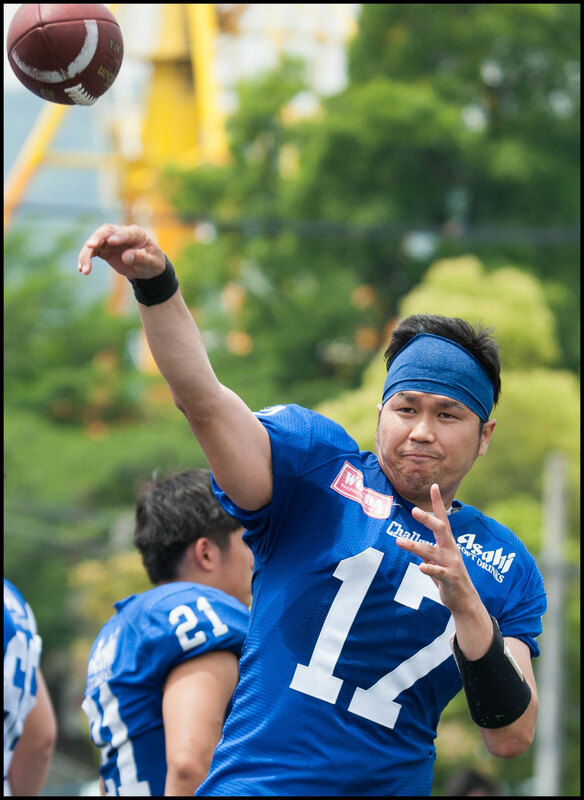 The opening drive saw five Elecom receivers pick up positive yards and starting QB Keijiro Kasuya completing all of his pass attempts. 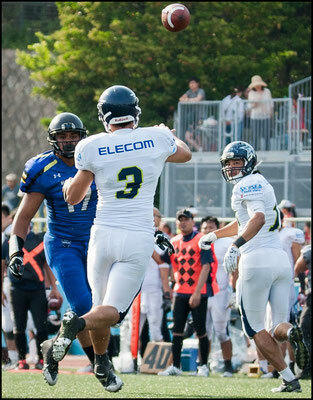 Elecom got no points on that drive but the offense got back to work on the next possession and got a field goal. 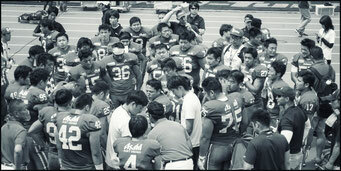 At 6:31 in the second quarter Elecom’s offense had possessed the ball for all but three and a half minutes of the game. That Elecom’s offense possessed the ball for the majority of three of those four quarters made no difference as the game that was tied 3-3 after Elecom’s only field goal quickly spun out of control. 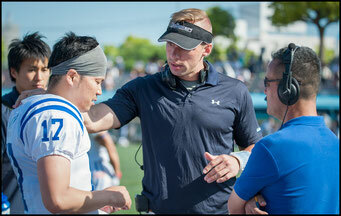 Panasonic needed less than 20 minutes to dismantle the Finies. 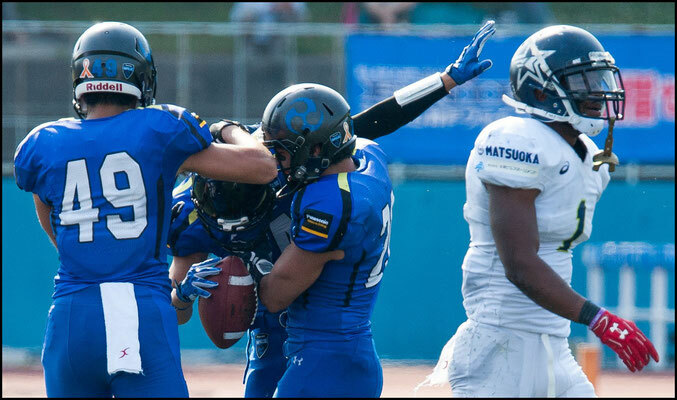 The Impulse simply couldn’t stay out of the end zone, scoring touchdowns on six of nine drives and field goals on two of the remaining three. 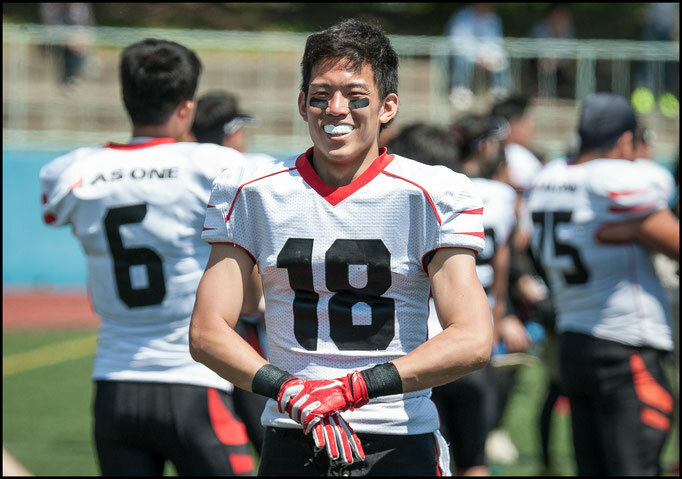 Number 19, Kei Ohara added a touchdown on a 30-yard punt return less than two minutes after RB Shun Yokota topped off his 104 yards of total offense with a 45-yard scamper to the end zone. 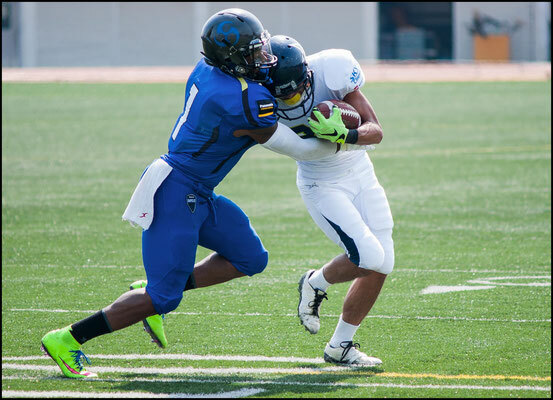 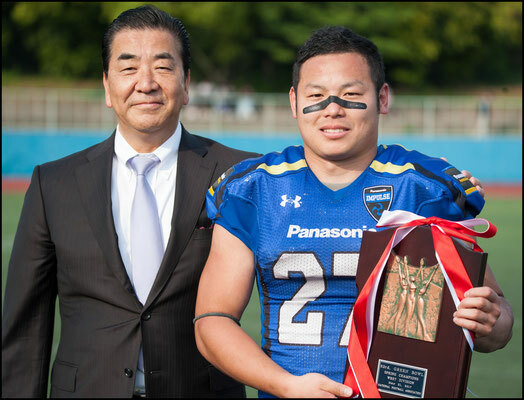 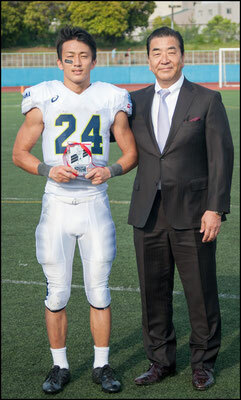 Yokota would be named MVP of the Green Bowl. 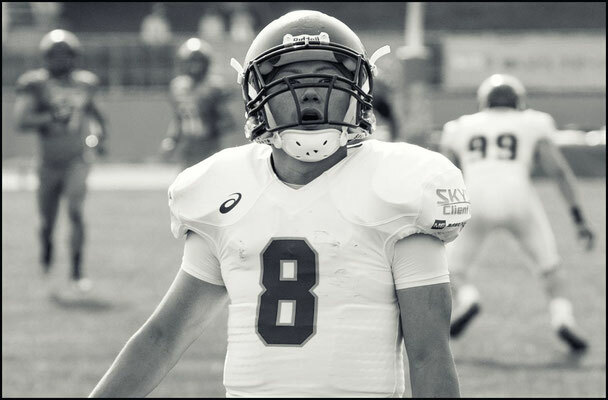 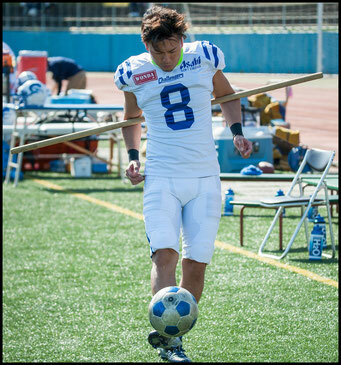 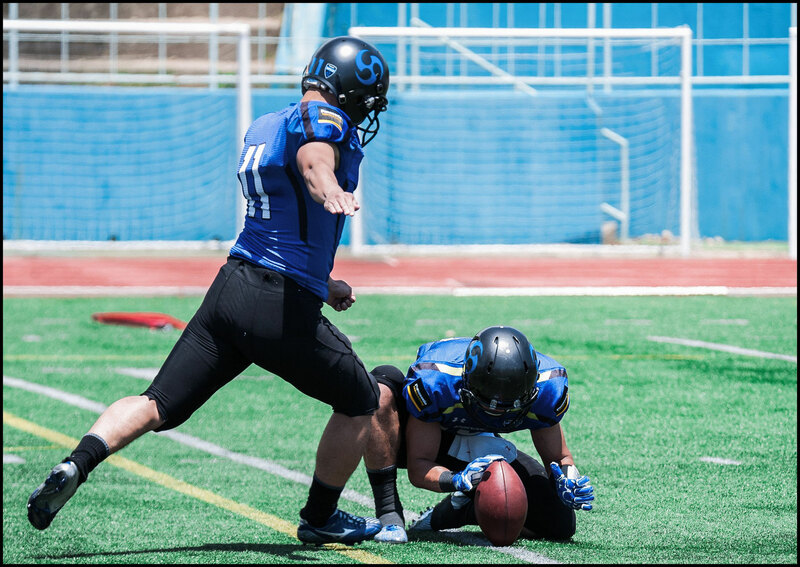 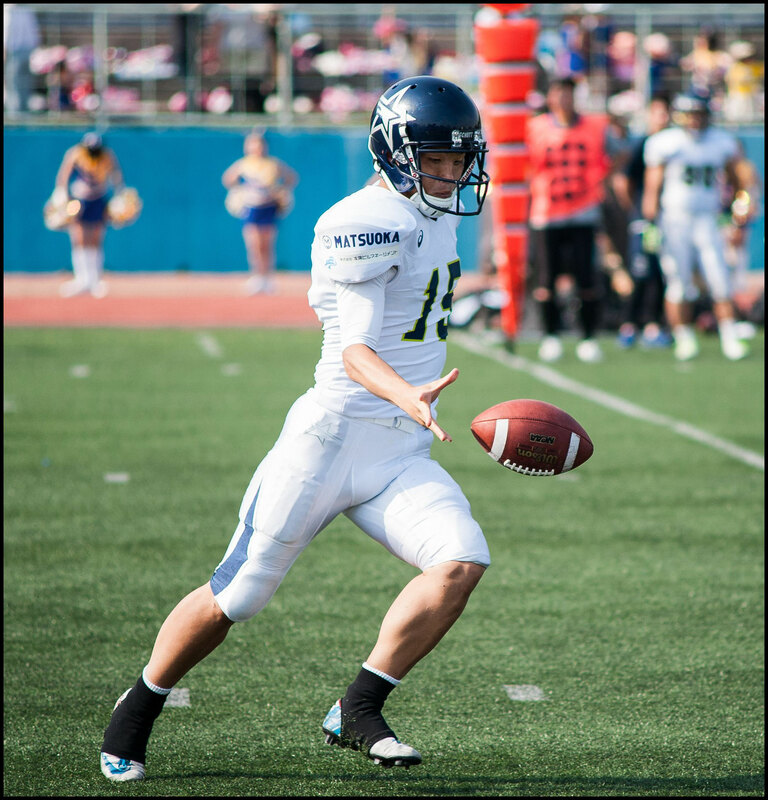 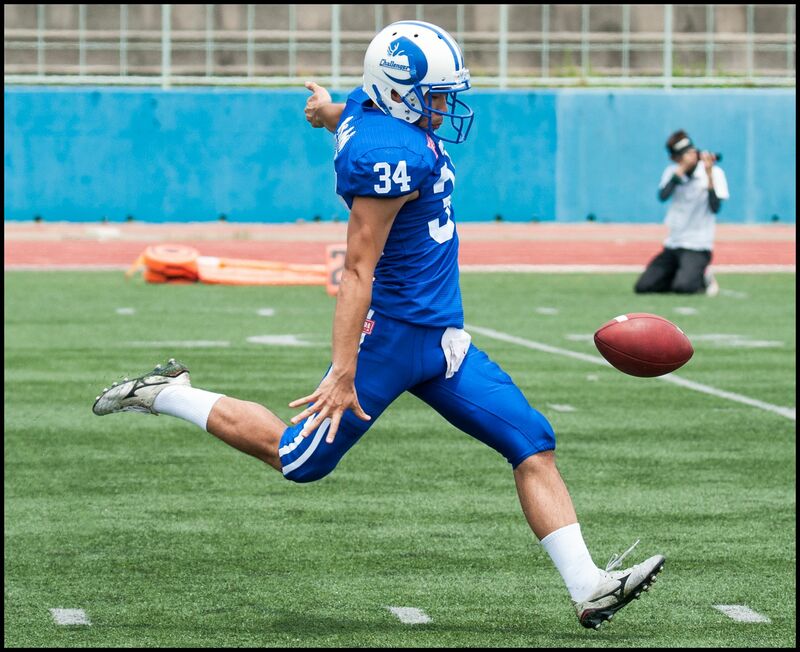 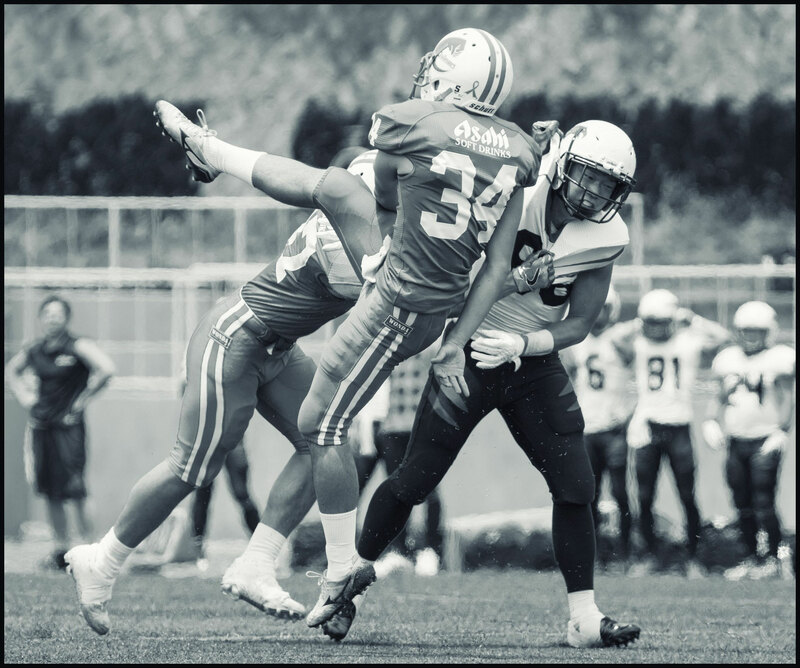 Special teams also had the strong and accurate legs of the Saeki brothers Eita and Shintaro, They shared kicking duties splitting the uprights all day and also repeatedly kicked the ball out of the end zone on kick offs for touchbacks. 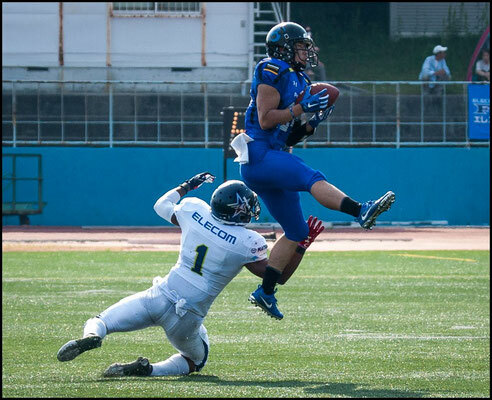 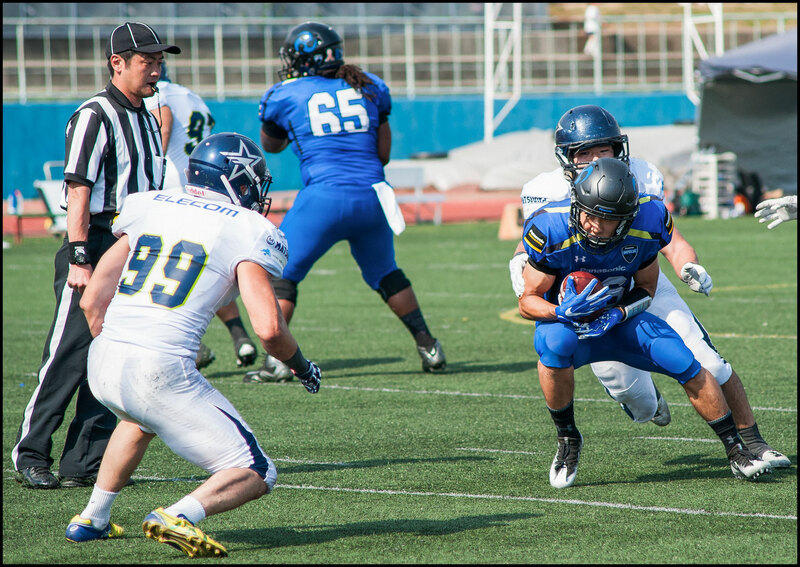 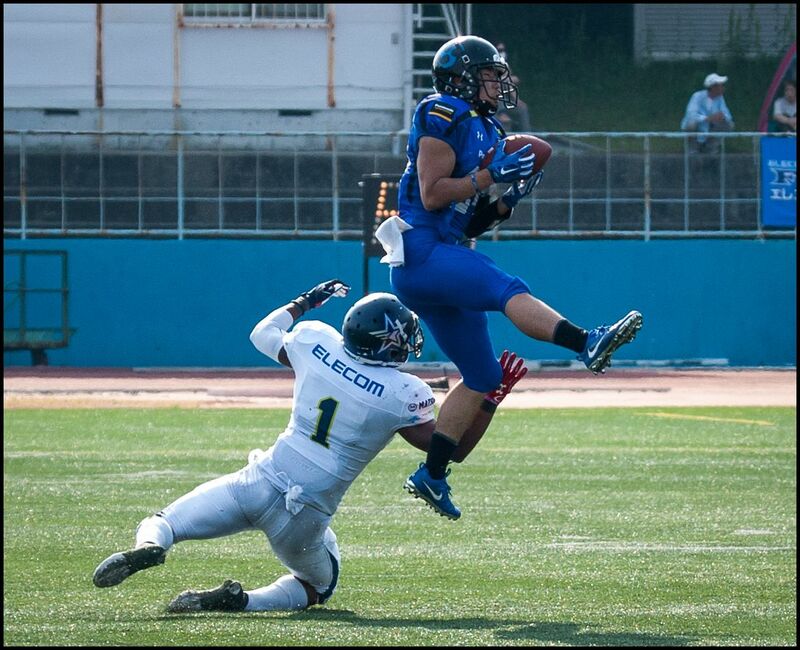 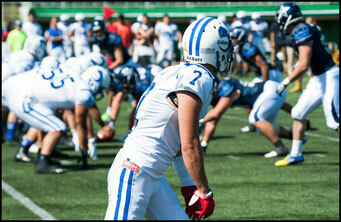 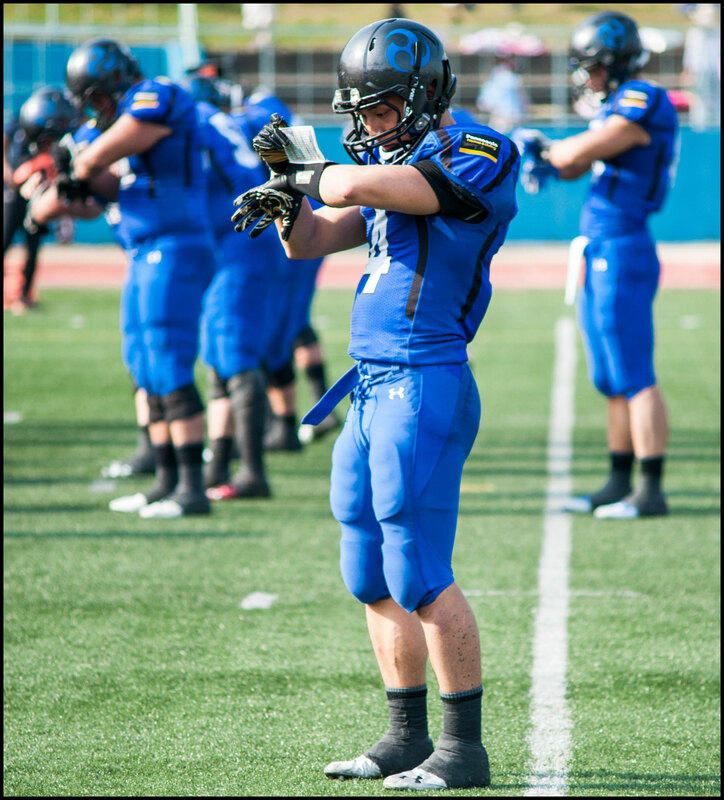 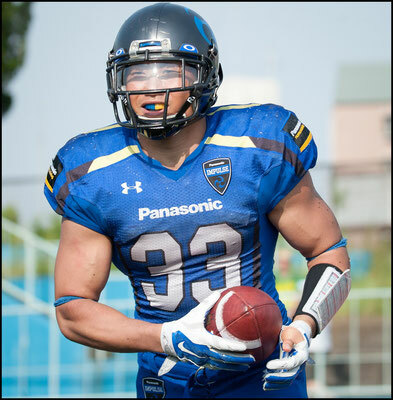 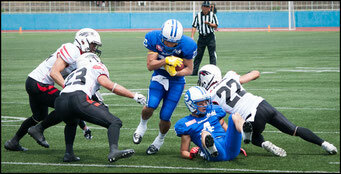 Panasonic’s defense had seven tackles for loss with number 9, DL Wataru Taketa, leading the way with three. 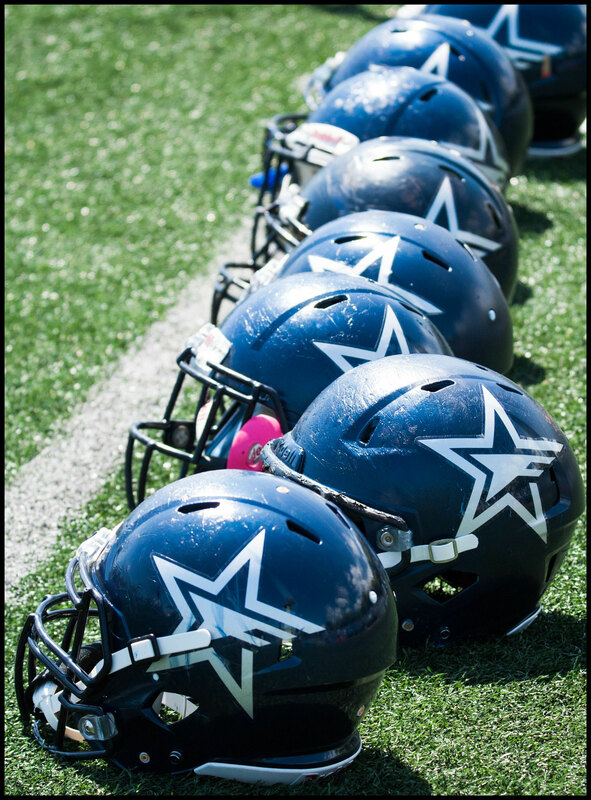 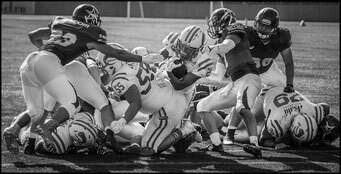 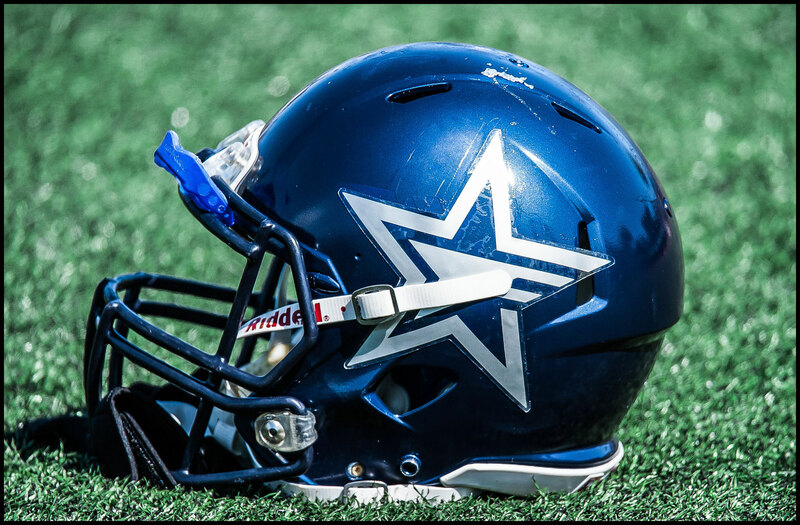 The defense also had two interceptions the second on a hail Mary pass that ended with the ball in the hands of number 49, DB Yudai Hikino, and no time on the clock. Despite the blowout loss, Gavin Farr said, “I’m looking forward to fall,” both he and Inoke said, they were proud of their team’s effort. 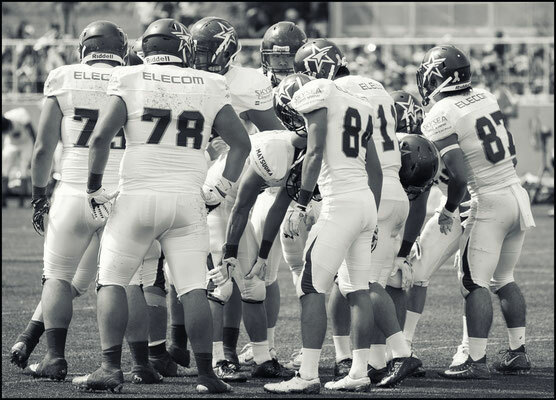 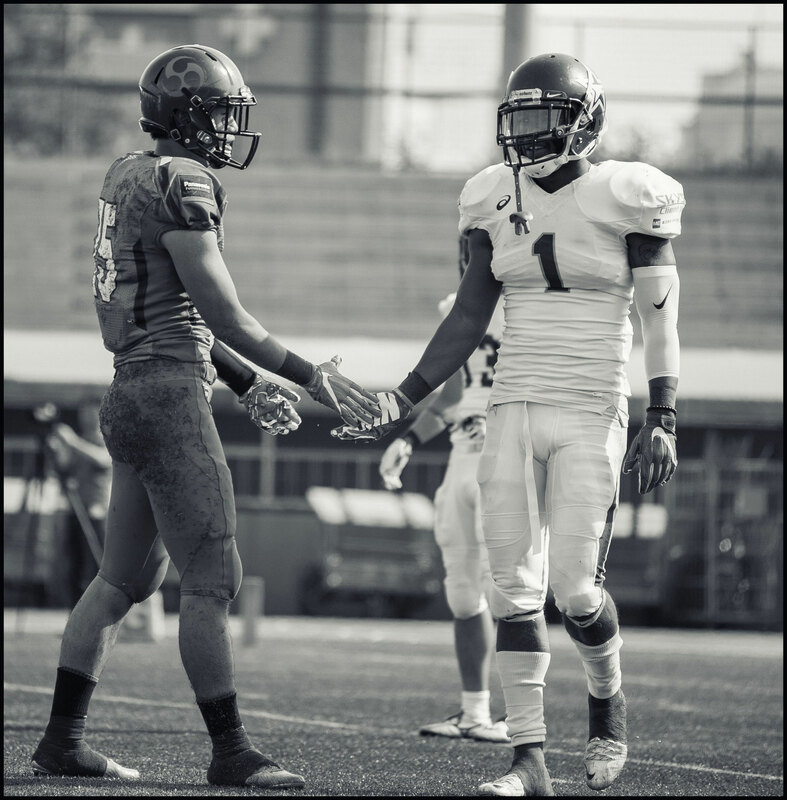 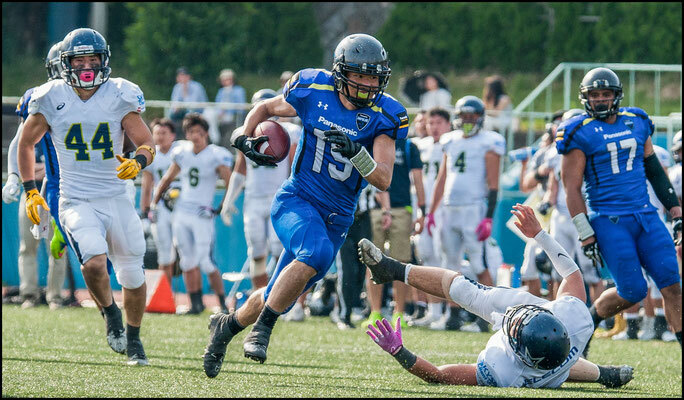 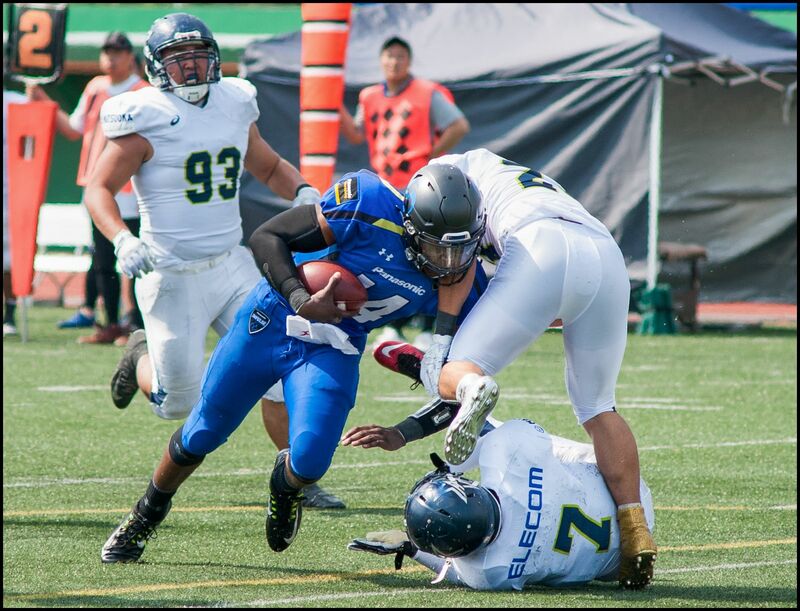 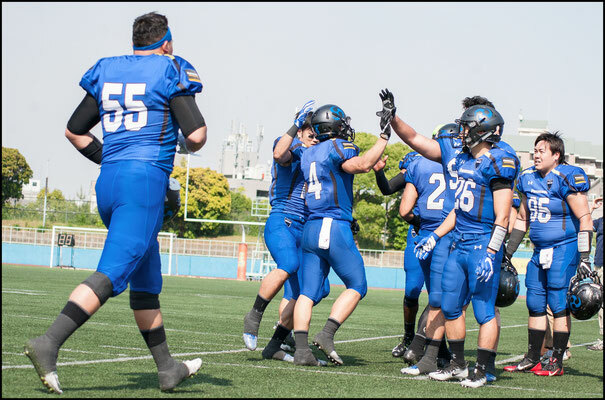 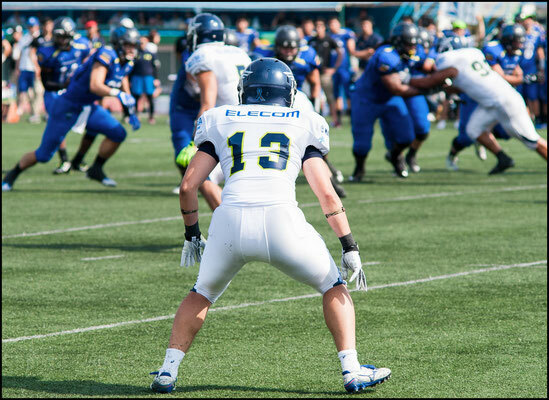 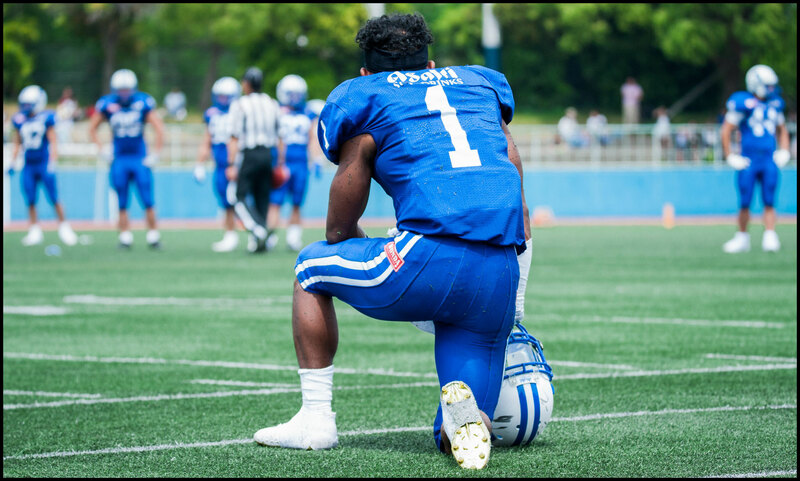 Elecom Kobe Finies will play in next in the league in Autumn, while the Impulse will get back on the Kobe Oji Stadium turf on June 4th against the nation’s top college team, Kwansei Gakuin University in the Kobe Bowl. 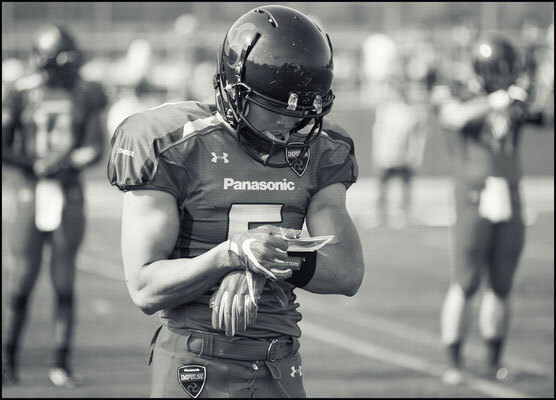 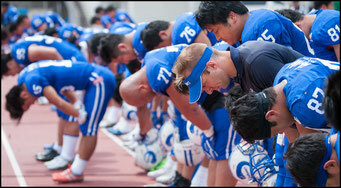 Panasonic has now won six of the last seven Green Bowl Championships and been in every final over the last decade. 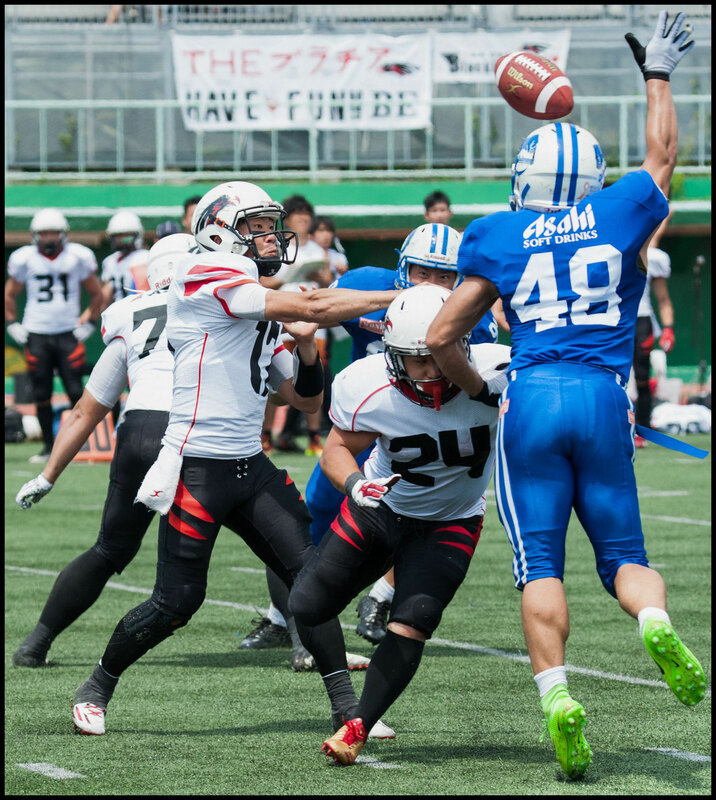 Asahi Soft Drink Challengers claimed third place in the Kobe Green Bowl over rival As One Black Eagles in a battle of punts. 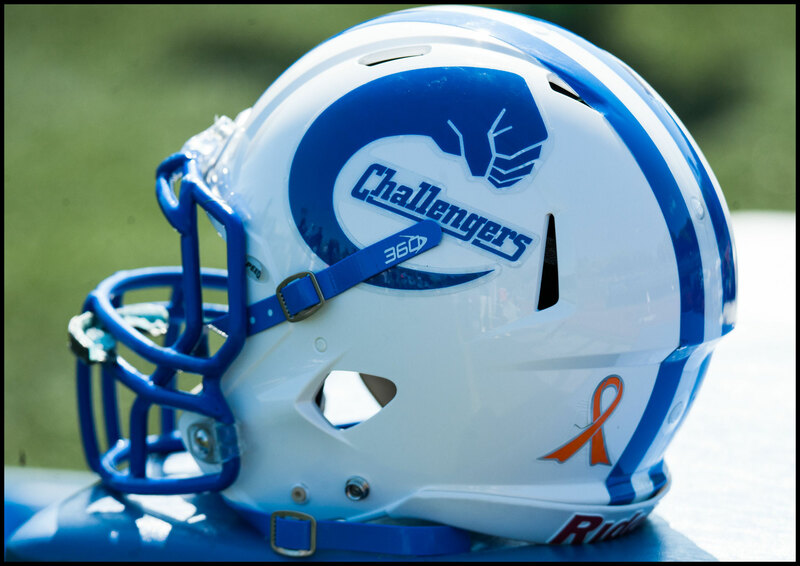 The Challengers managed just five first downs all game, failed to convert any third or fourth down attempt, but scored on three big plays in a 21-0 victory. The first touchdown came midway through the second quarter on an 85-yard punt return. 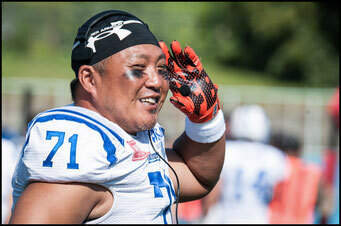 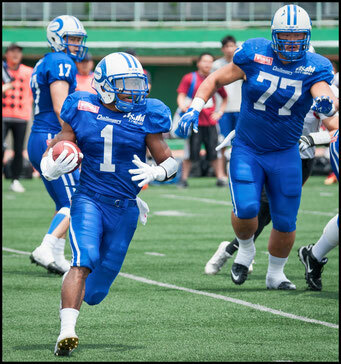 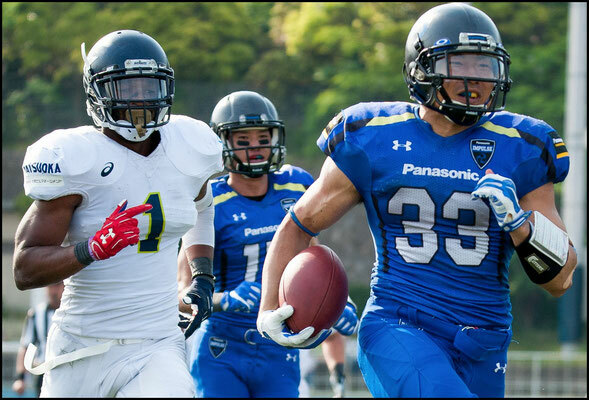 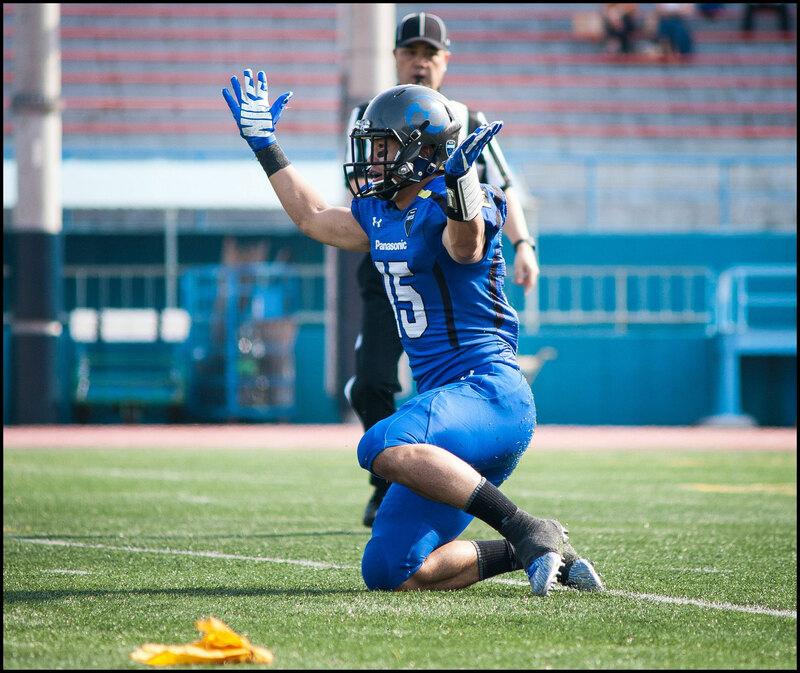 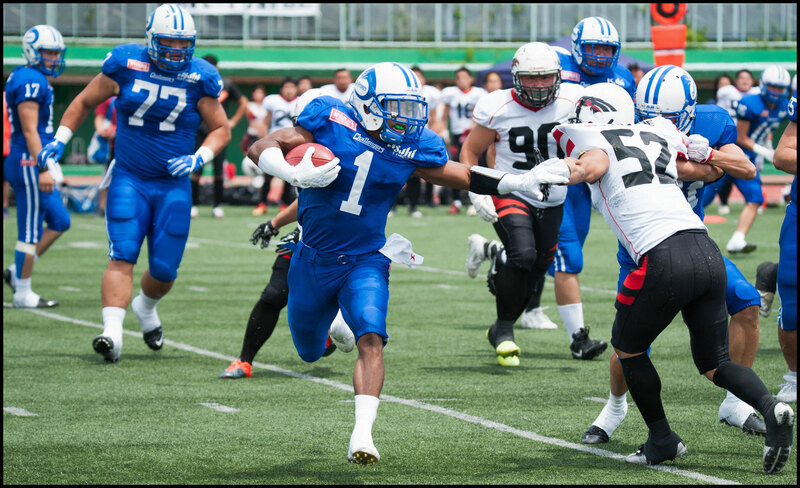 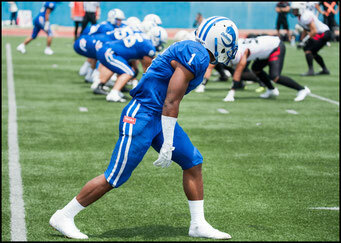 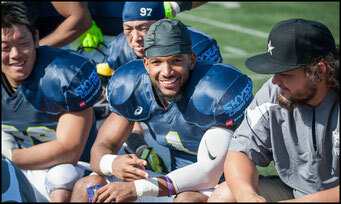 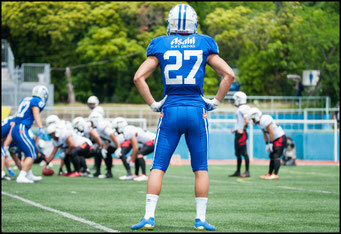 Asahi added two more TDs with less than two minutes on the clock in the fourth quarter to seal the victory. 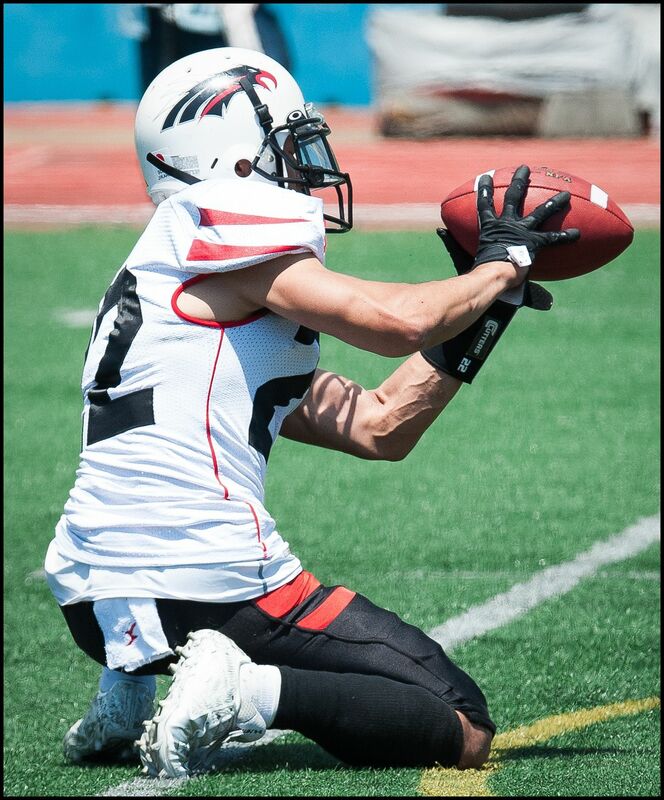 The drive that lead to the first of those scores utilized the versatility of American WR Donnie King. 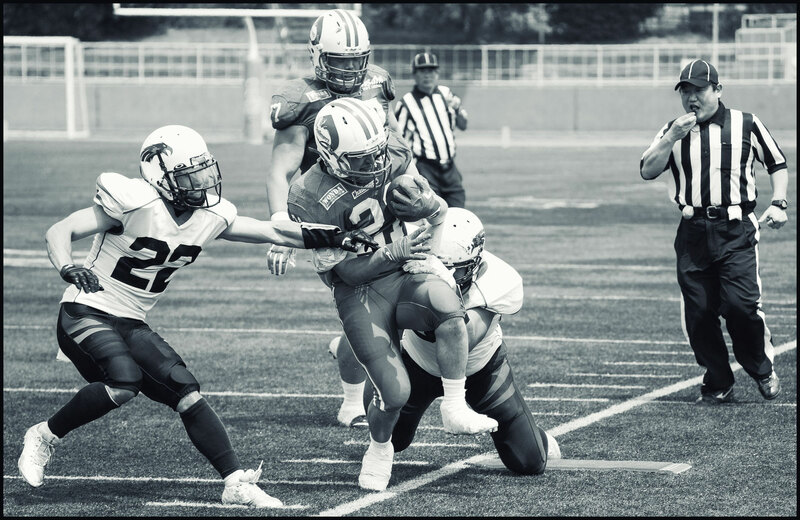 Late in the fourth, after the Challengers defense forced Black Eagles’ ninth and final punt of the game, Niznak went back to the same play and King for a 12 yard run and followed that with a long pass to King that was called back on a penalty. 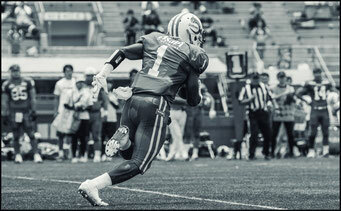 On second and 20, King’s number was called again and he caught a 27-yard pass down the middle of the field. 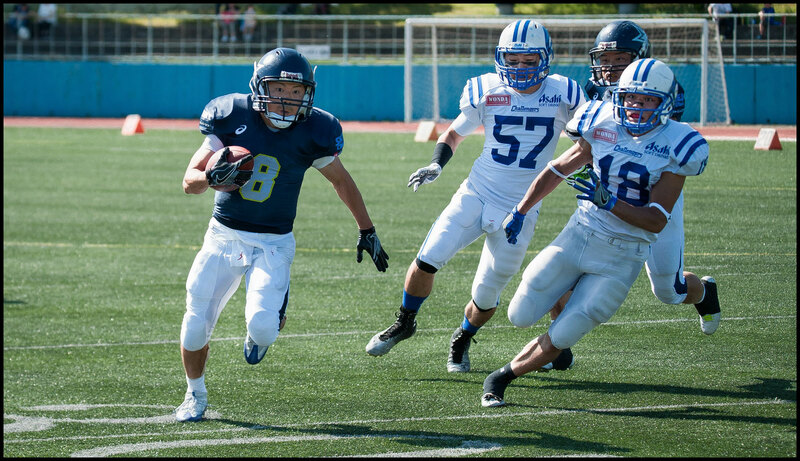 Two plays later RB Seiya Nagayama ran 31 yards around the left for the score. 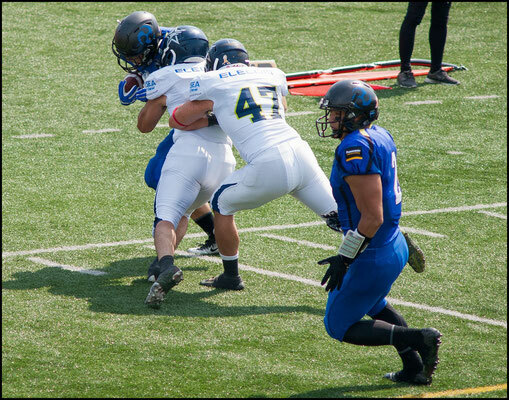 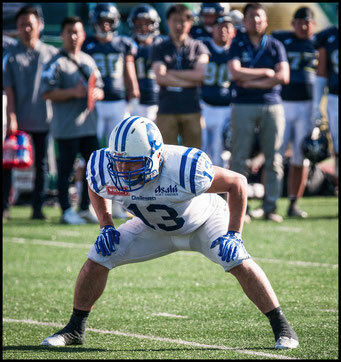 Asahi DL Takuya Yamamoto continued his strong performance by adding an interception to his two backfield tackles for loss. 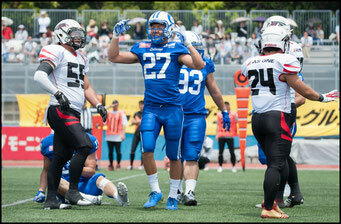 It was Asahi’s second INT of the day. 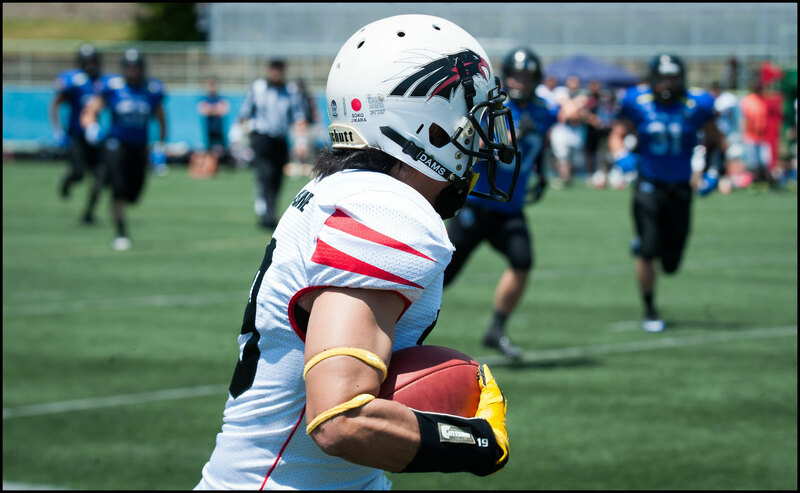 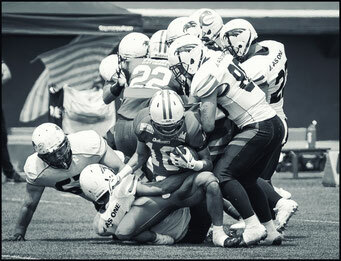 Unlike the first however this one led to points as RB Kenji Ando went 29 yards for the touchdown. 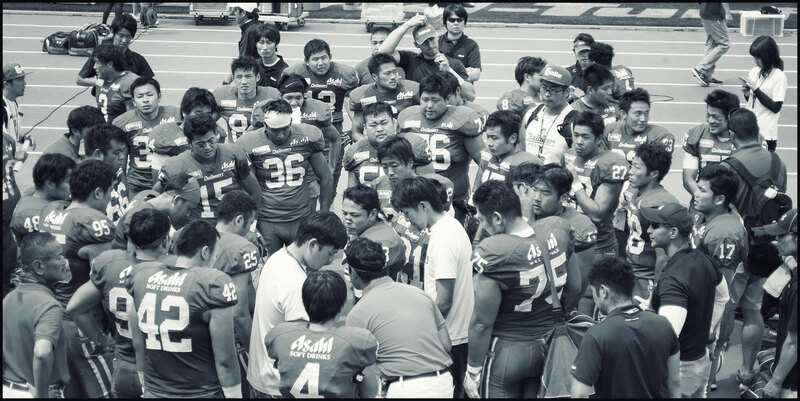 Time expired on the ensuing kick-off and the Green Bowl third place bragging rights went to Asahi Soft Drinks Challengers. 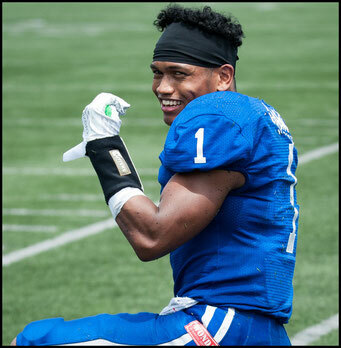 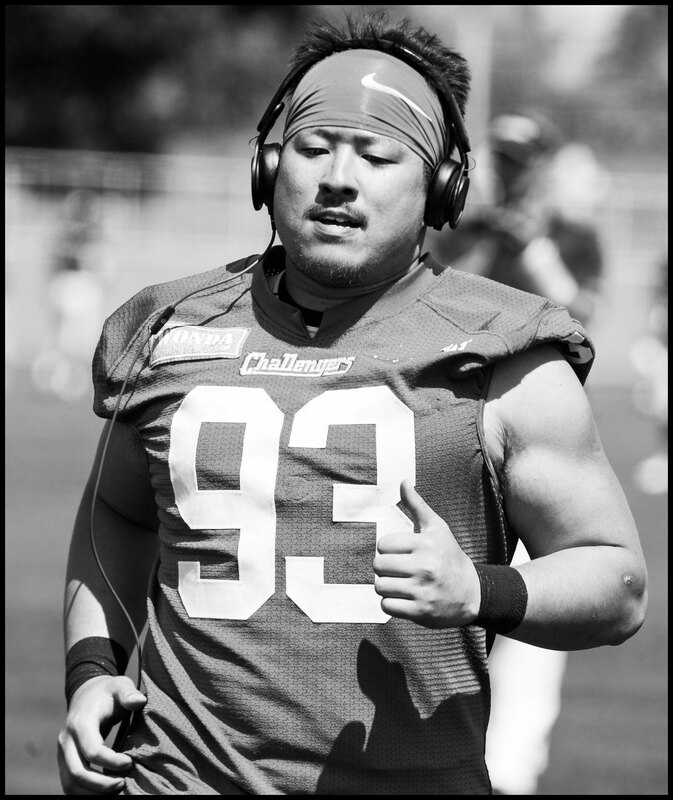 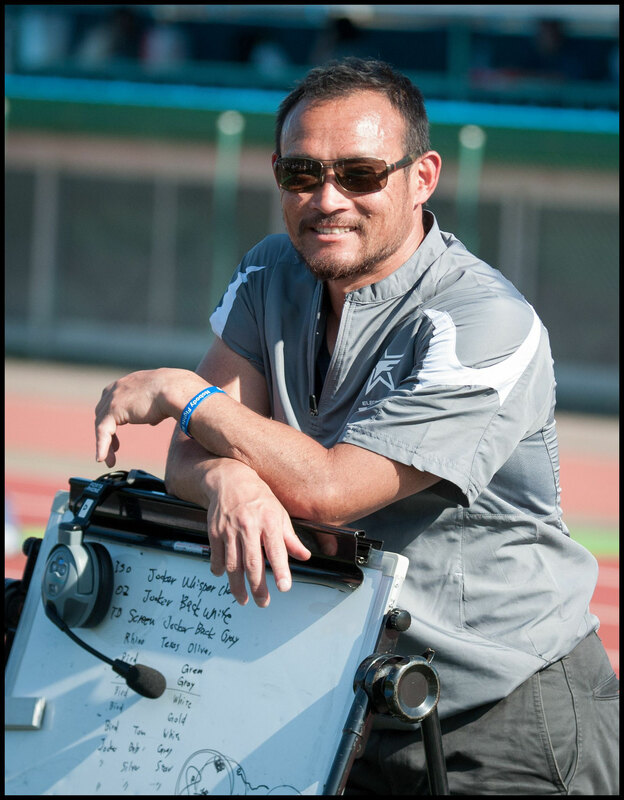 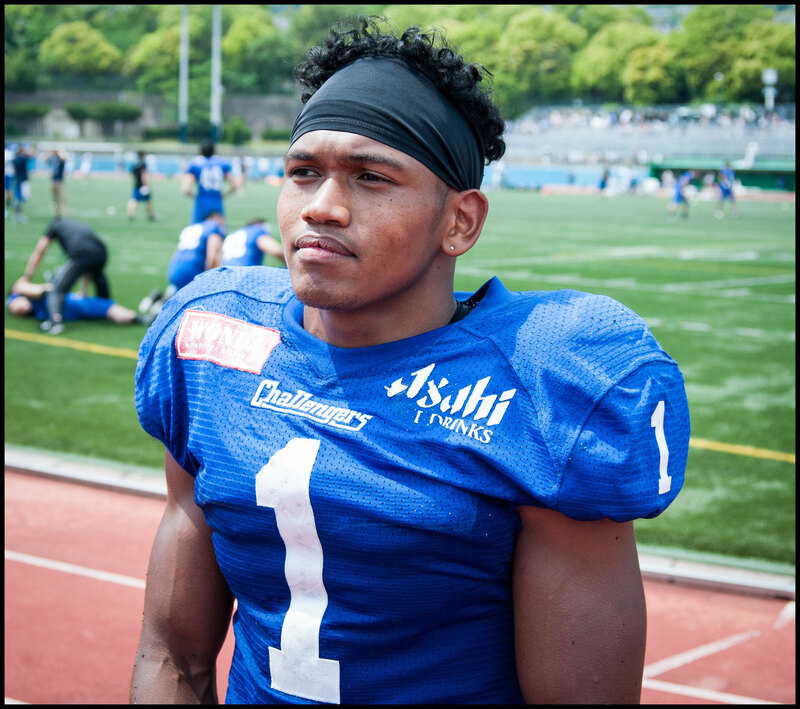 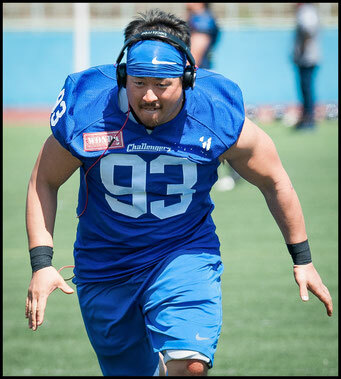 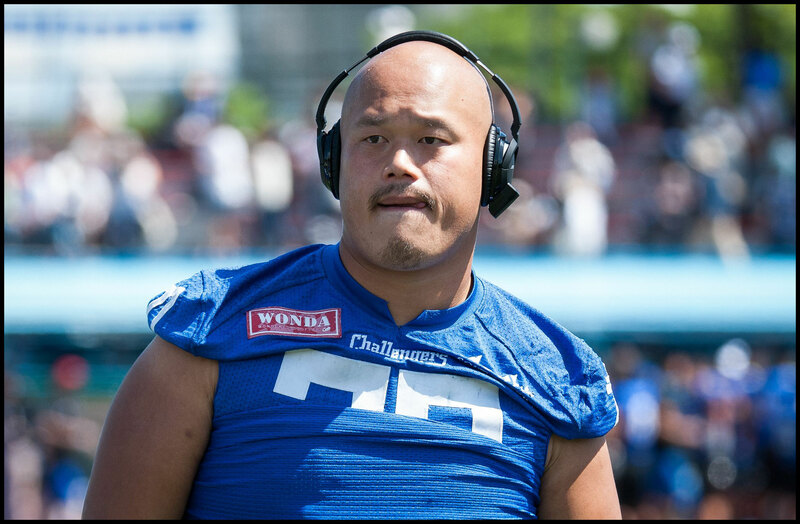 Asahi plays again next week and Niznak expects to be on the field, “We saw a lot of pieces and we’re excited to build on that in the Amagasaki Bowl next week. 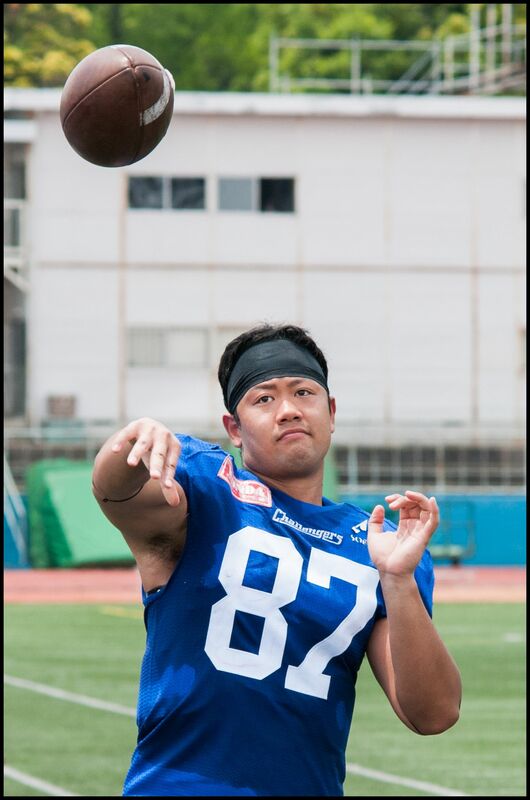 I’m looking forward to making my debut on the field.” King is looking forward to it as well saying, “We’ll finally have Alex, it going to be a ball! 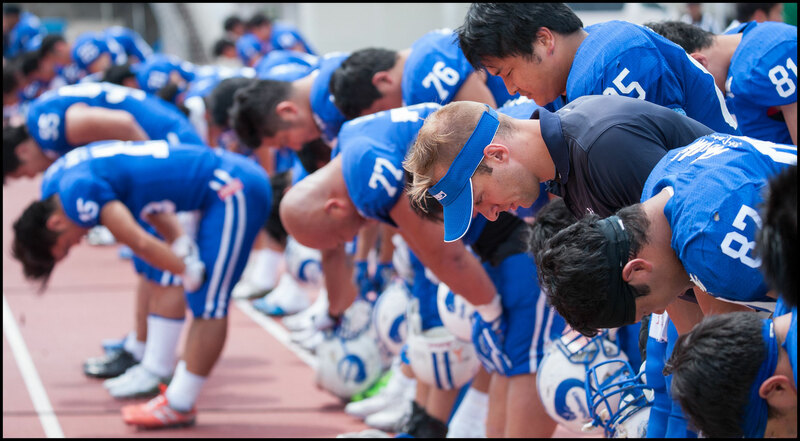 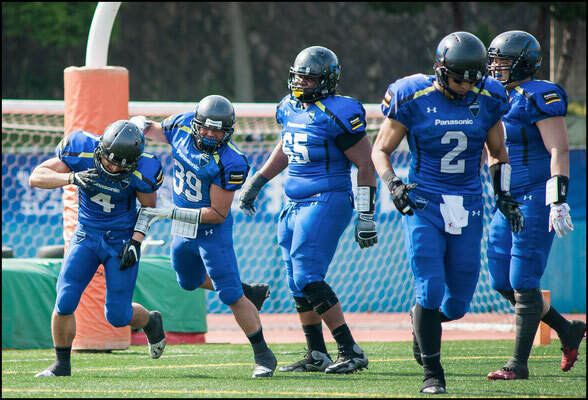 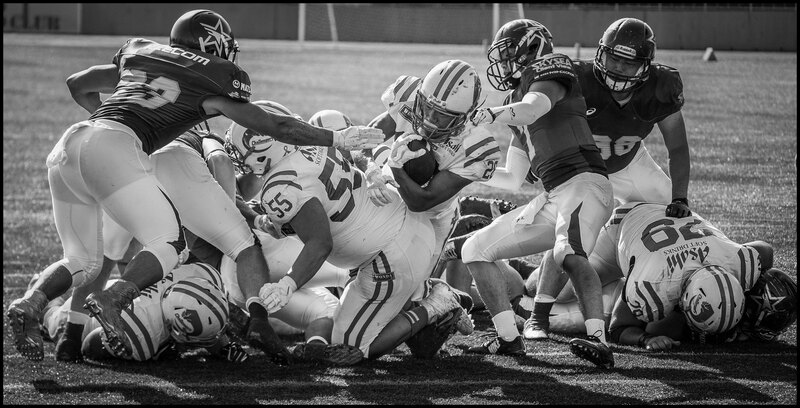 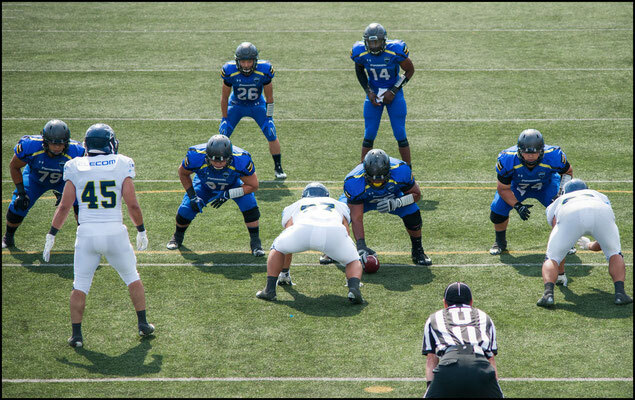 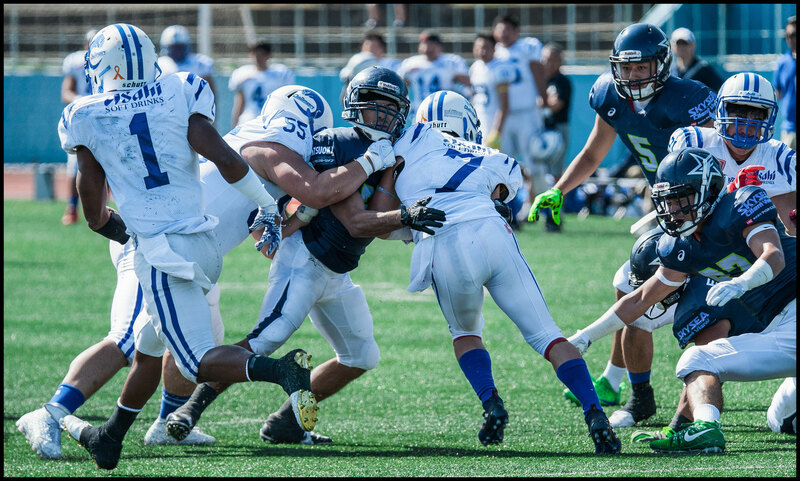 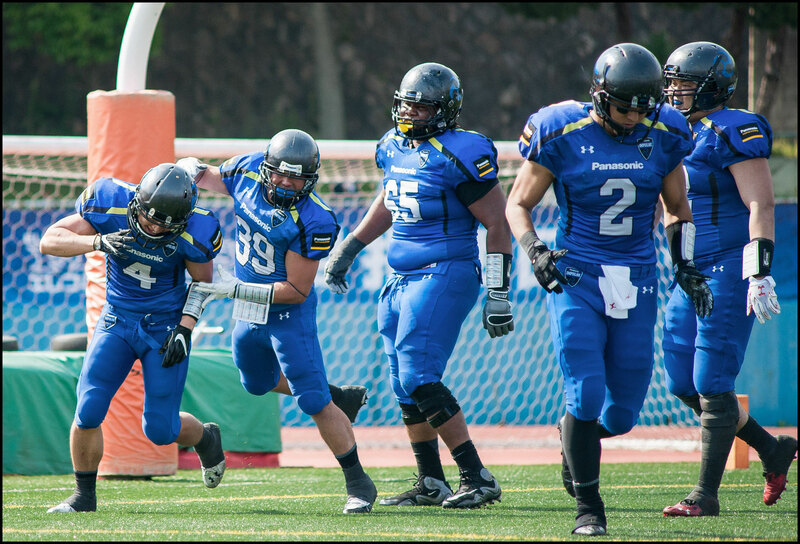 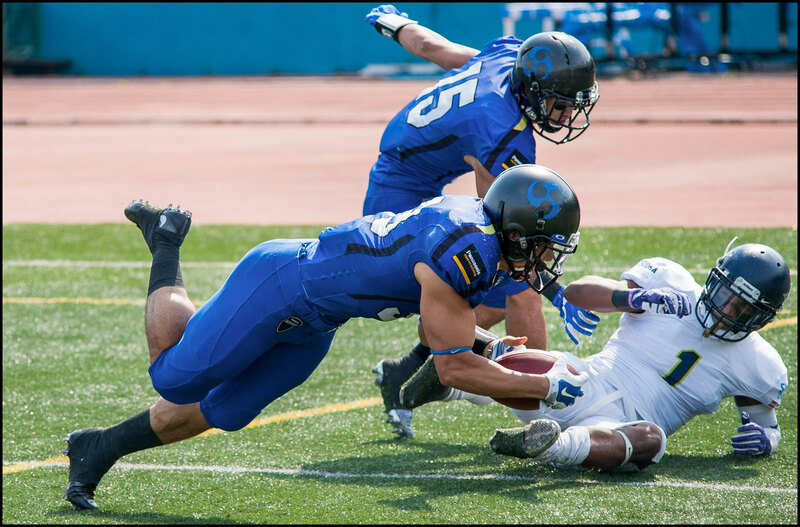 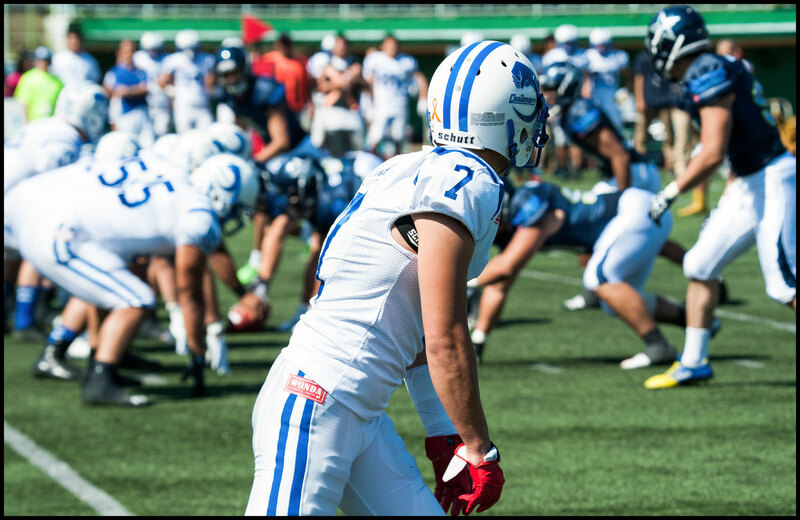 An exciting and fun game to watch!” The Amagasaki Bowl will pit Kinki University Devils against their pro-rival in Amagasaki Kinen Koen on May 28. 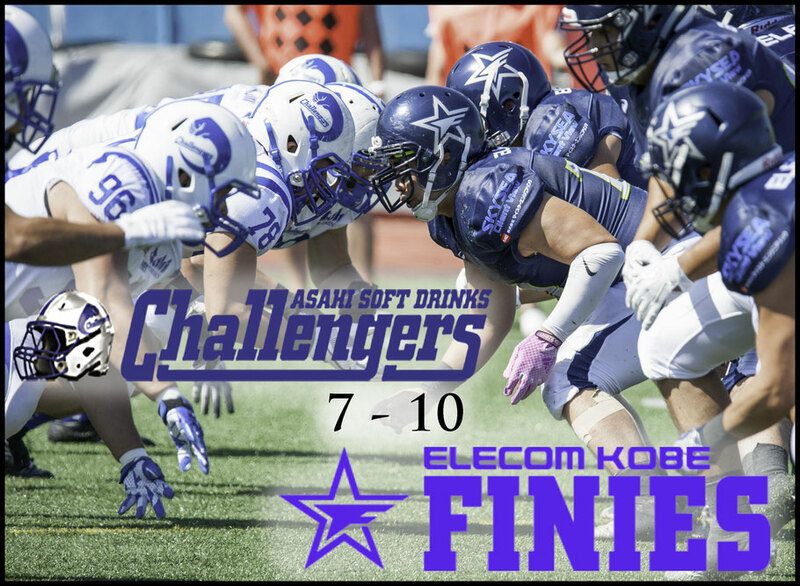 In the second game of the 2017 Green Bowl, with a warm afternoon breeze drifting though Oji Stadium, the Elecom Kobe Finies held on for a 10-7 win over the Asahi Soft Drinks Challengers. 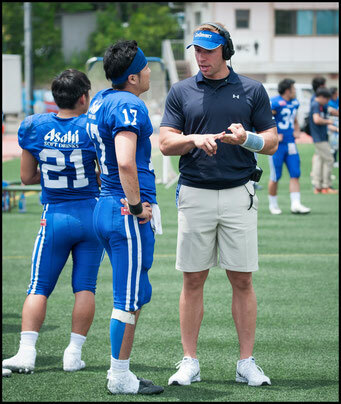 Fans who came to get a look at the Challengers' newest foreign import, QB Alex Niznak, saw him in action, though not under center. Roaming the sidelines, enthusiastically calling plays while wearing a headset over his blonde crew cut, Niznak stood out. 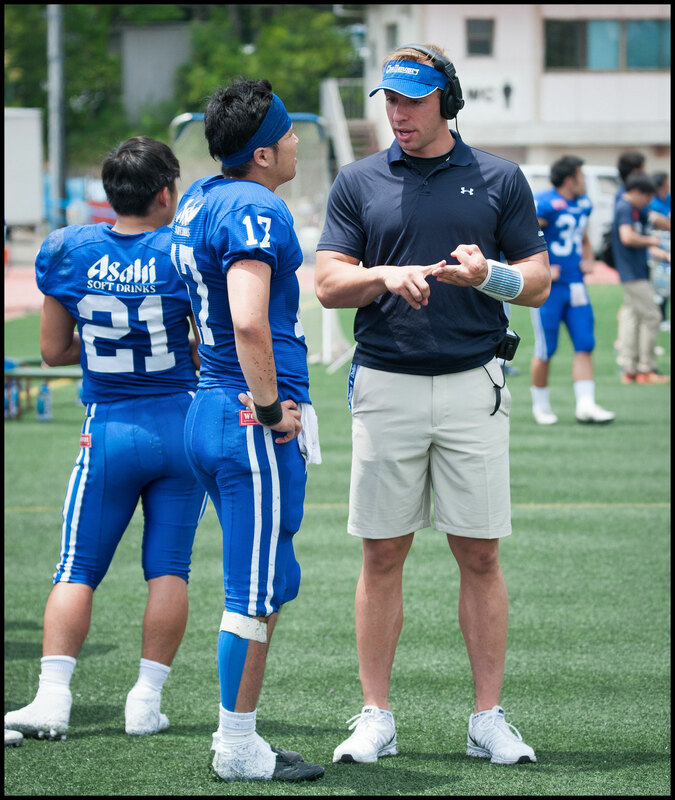 Head and shoulders above the other coaching staff, he looked a little out of place but that’s not to say he didn’t fit in with his new team. With lists of plays, both on his arm and hanging from his belt, Niznak flashed hand signals to the offense and shouted encouragement from the edge of the field. Unfortunately for the Challengers, his flurry of activity made little difference on the field. 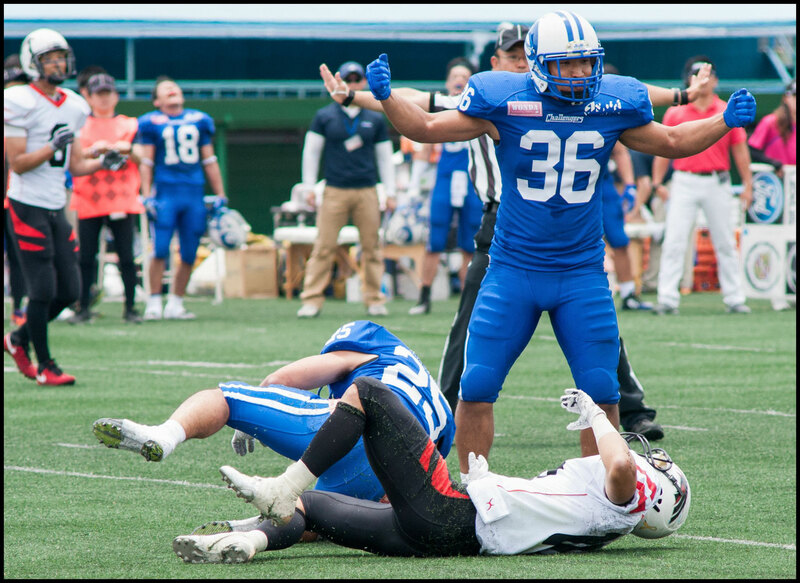 Recognizing this himself he edged ever closer to the action and nearly had to be restrained from walking on the field to take over. 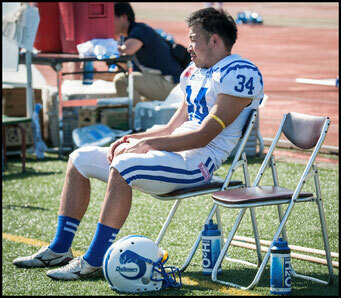 The former Tyreso Royal Crowns QB is still waiting for his visa to clear. “I’m looking forward to getting on the field, hopefully I can play in the next game.” he told Inside Sport: Japan Even if the visa doesn't arrive in time for him to play in the third-place game of the Green Bowl in two weeks, the Challengers have landed a natural born leader and big personality for the upcoming season. 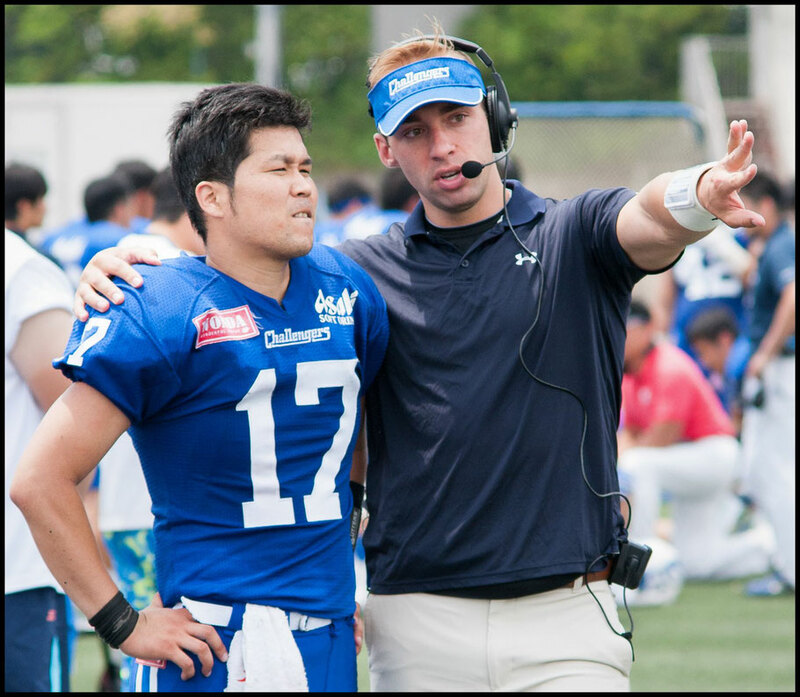 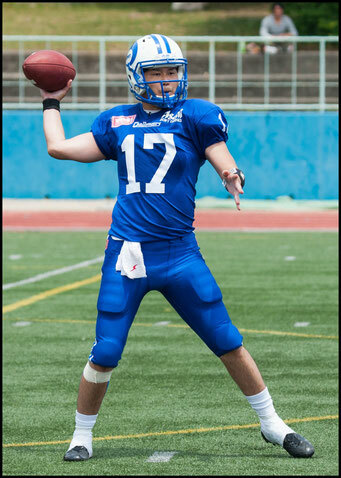 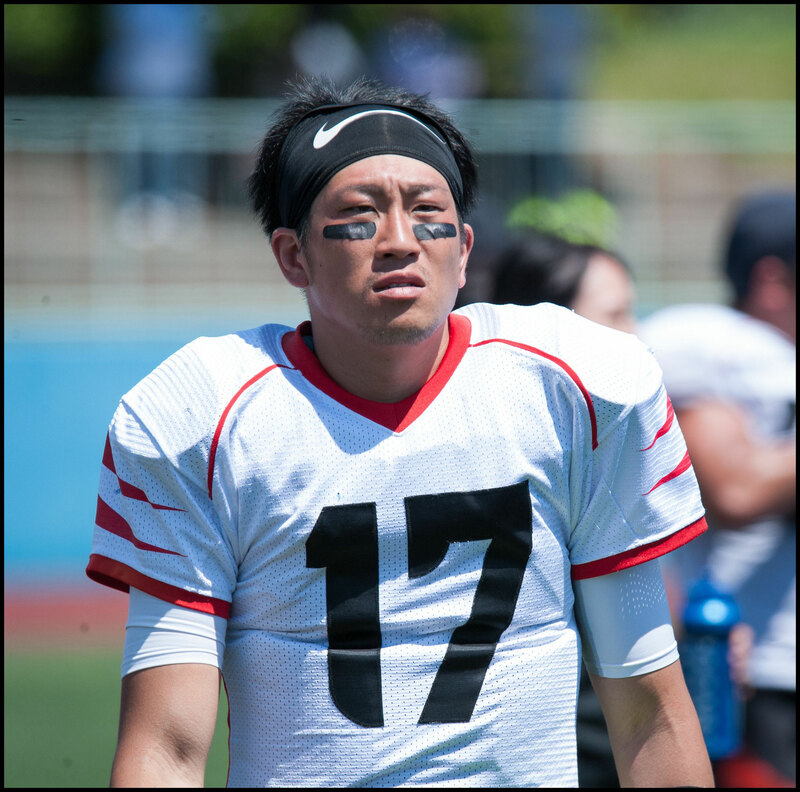 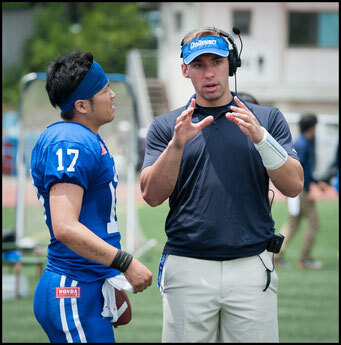 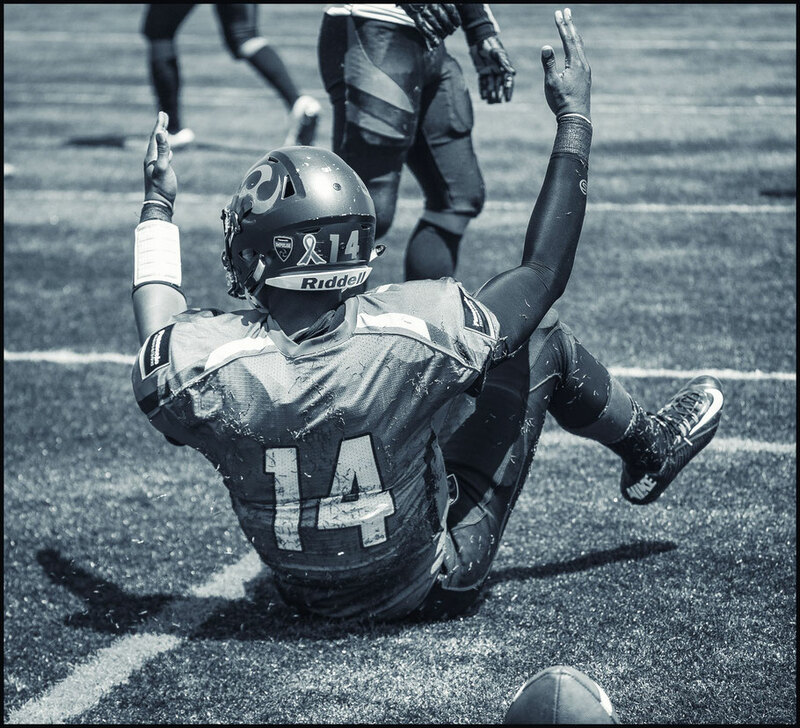 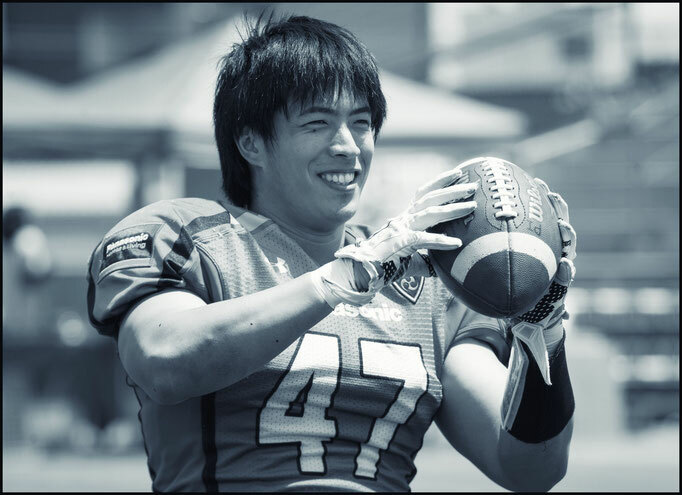 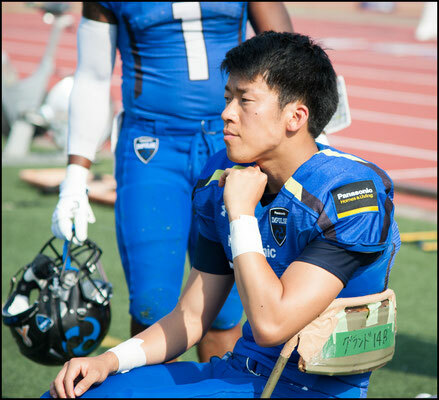 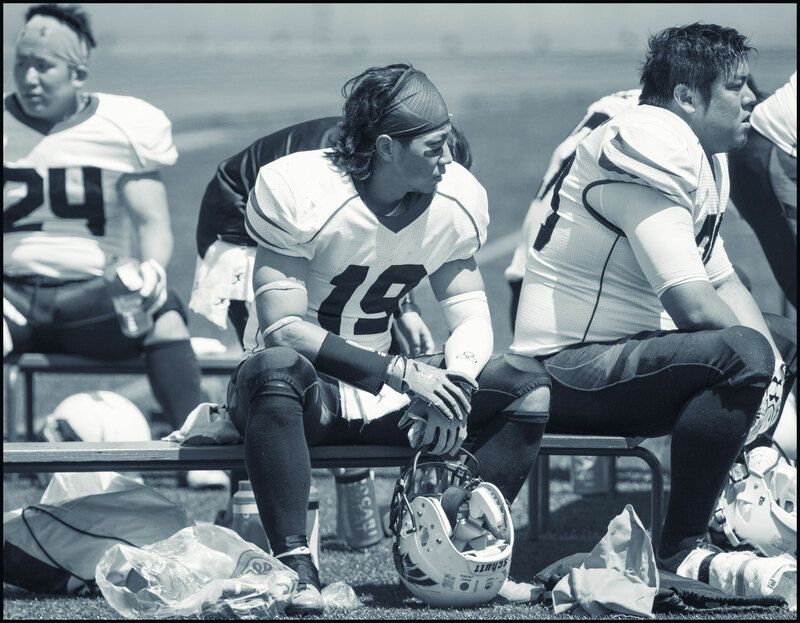 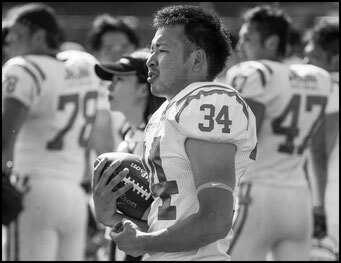 Starting quarterback for the Challengers, Yusaku Miyagi, demonstrated why they need Ninzak on the field with two interceptions and a general inability to get into a rhythm. The Challengers started the game going three and out on three of their first four possessions, and followed that with interceptions on the next two. 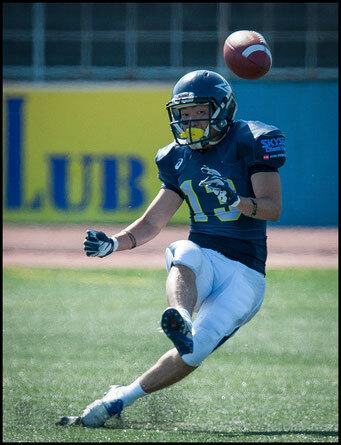 Former Iowa Hawkeye and Finies DB Sean Draper, hauled in the second of the two interceptions which led to a field goal. 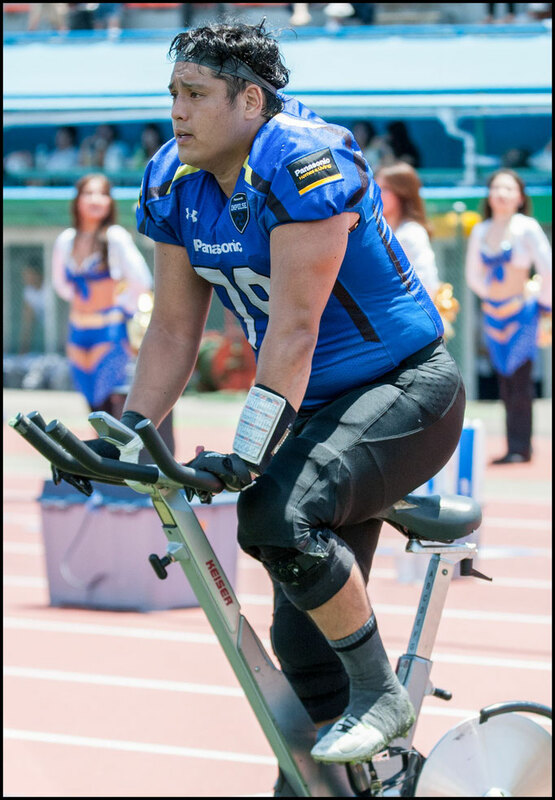 Draper said, “It felt good. Overall the game was good. 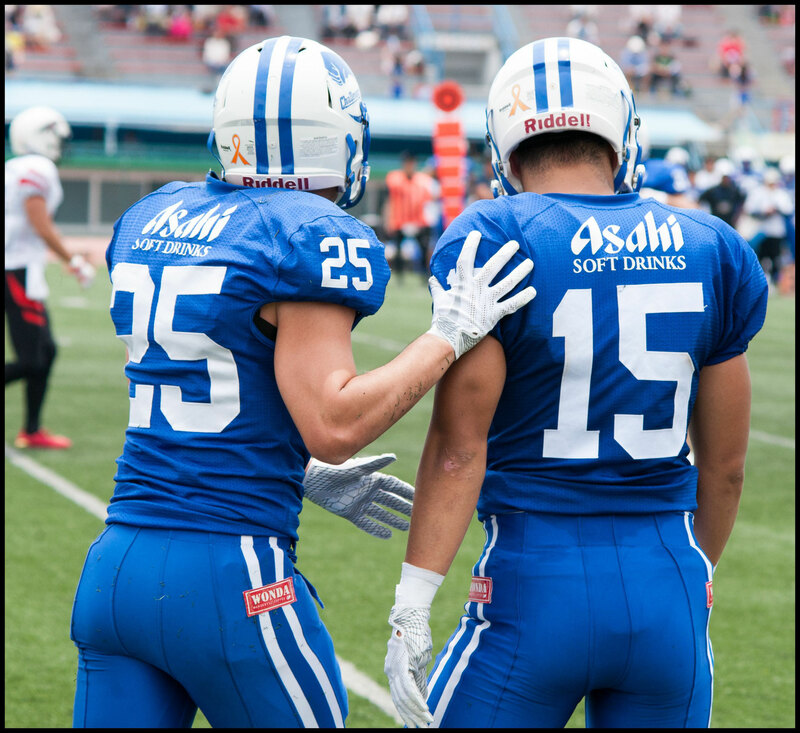 We just need to execute defensively in the red zone.” Stopping Asahi was made easier by their eight penalties for 83 yards and problems on special teams. The Challengers woes started in the second quarter when the Finies punted from their own end zone, the returner, after a moment of indecision, couldn’t keep his feet away from the ball and it skidded across his laces and right to the Finies, who recovered it around midfield. 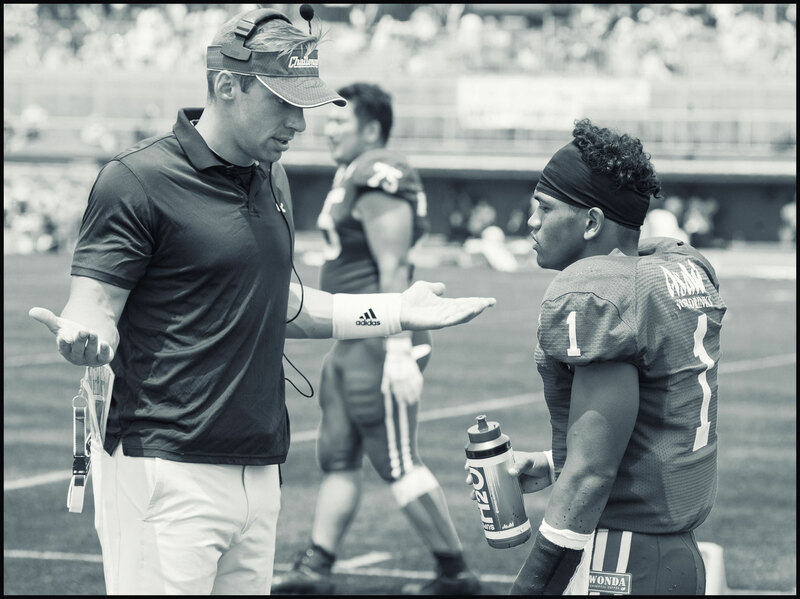 While the referees took their time figuring out what had happened, the Finies new offensive coordinator, American, Gavin Farr, drew up a passing play that his team executed to perfection. 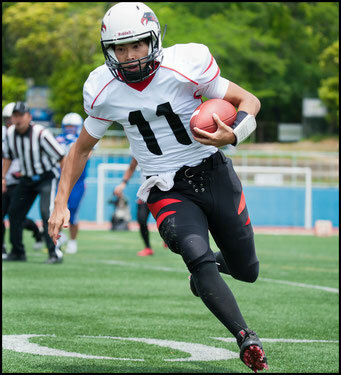 Finies quarterback, Keijiro Kasuya, unleashed a high spiral deep into to the end zone for their only touchdown of the game and a 7-0 lead. 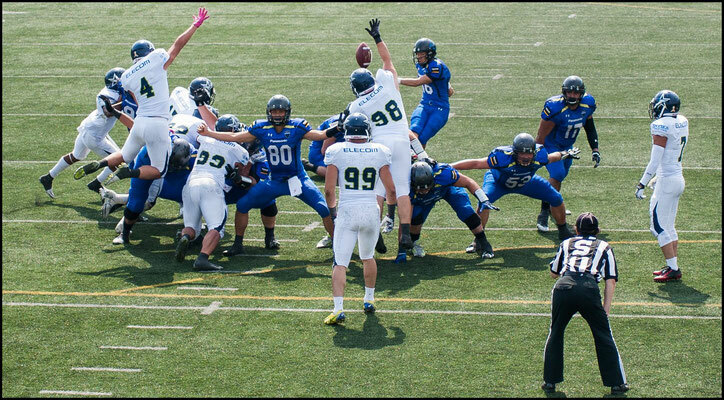 The Finies extended the half time lead to 10-0 with a FG. 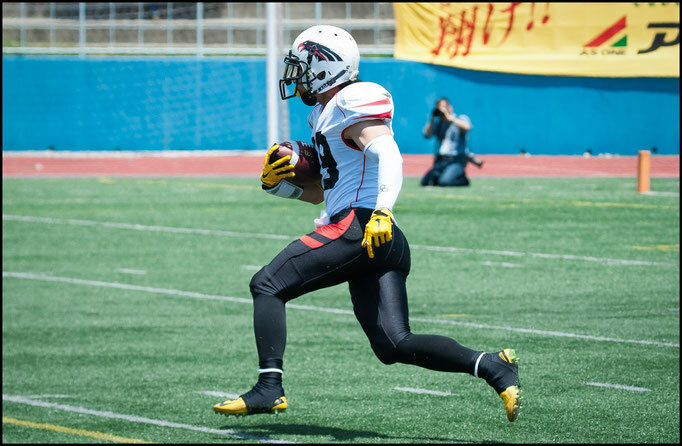 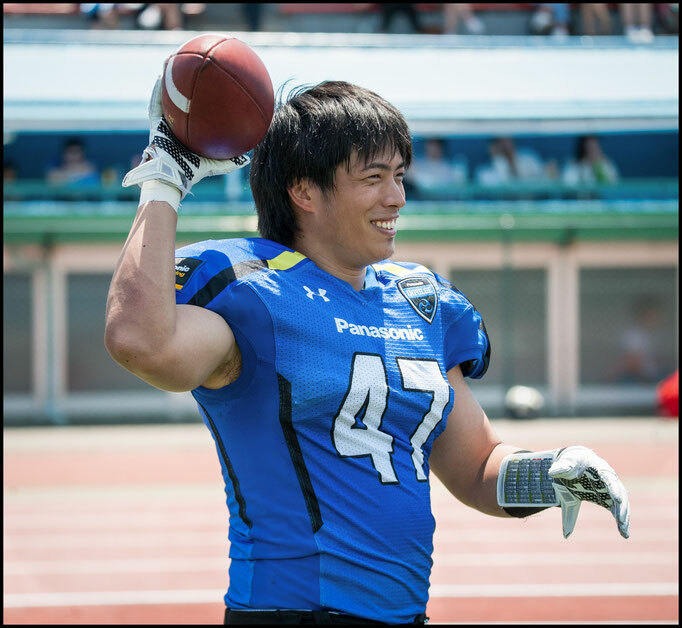 The Challengers were able to get into the end zone in the second half after going repeatedly to running back Yutaka Tatsumi, who had his number called eleven times in a row before finally punching through for the Challengers only score of the game. Asahi almost mounted a comeback late in the fourth quarter. 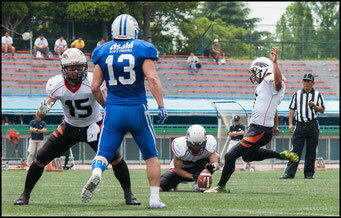 With less than a minute to play, the Challengers managed to get into field goal range and set up to kick for the tie. 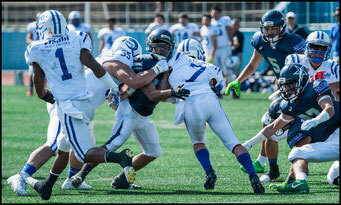 Unfortunately for the Challengers that attempt was blocked just as convincingly as their previous two had been. 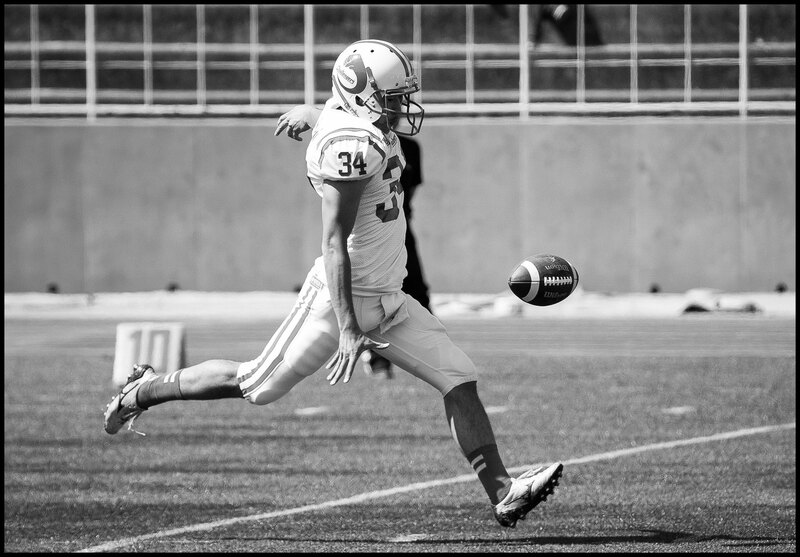 Only one of the Challengers three field goal attempts on the day even cleared the offensive line but that too was promptly swatted back to the Oji Stadium turf. 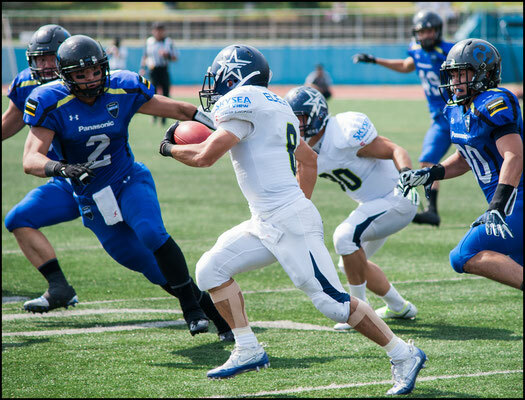 Oji Stadium will host Green Bowl final on May 21, when the Finies will have a much tougher task against three-time national champion Panasonic Impulse. 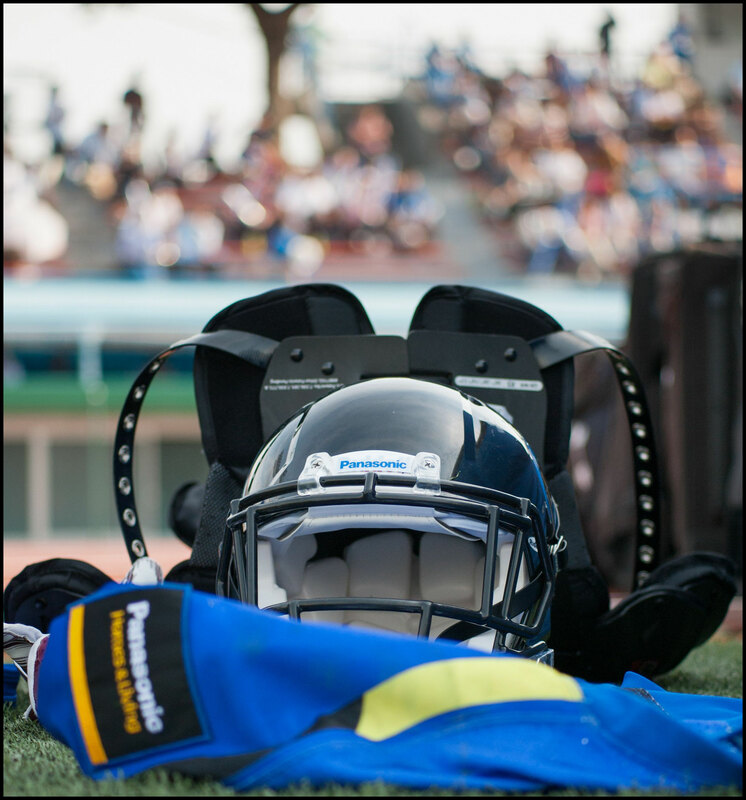 The Green Bowl 2017 kicked off under blue skies, at the foot of the Rokko Mountains with defending champion Panasonic Impulse sweeping aside the As One Black Eagles 49-10. 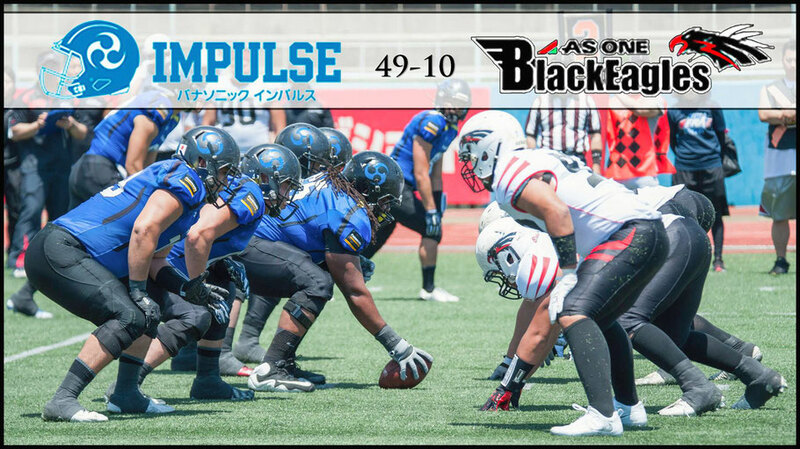 Impulse dominated all but a few minutes of the game, which was a clean, entertaining affair despite the result never being in doubt. 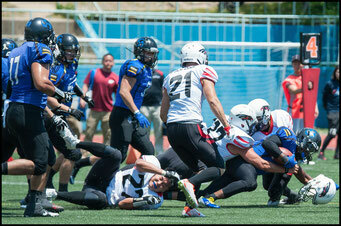 The Black Eagles started the game with 15 and 9 yard runs to get to midfield. 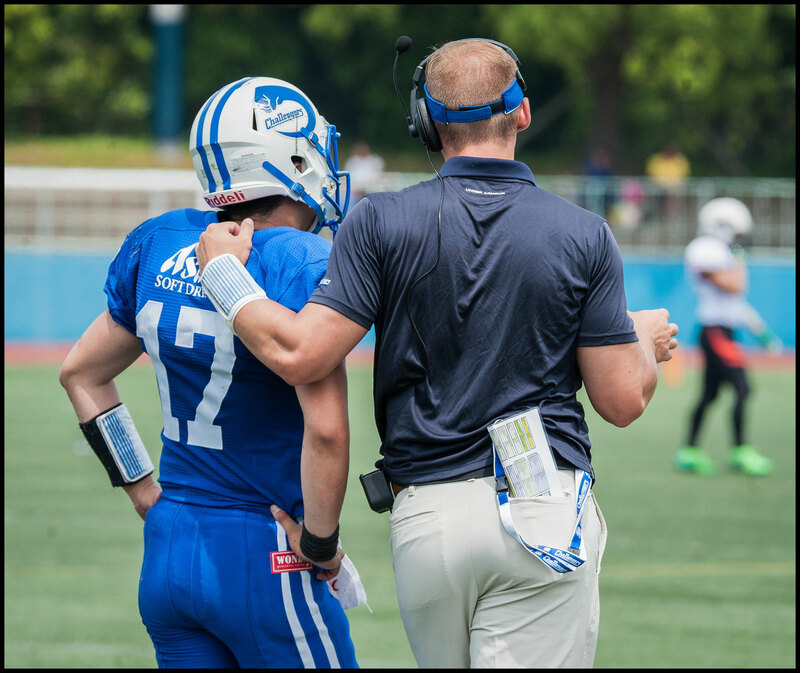 That though would be the extent of their success for the first quarter as the difference in quality began to show early on. 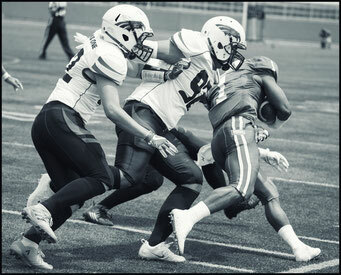 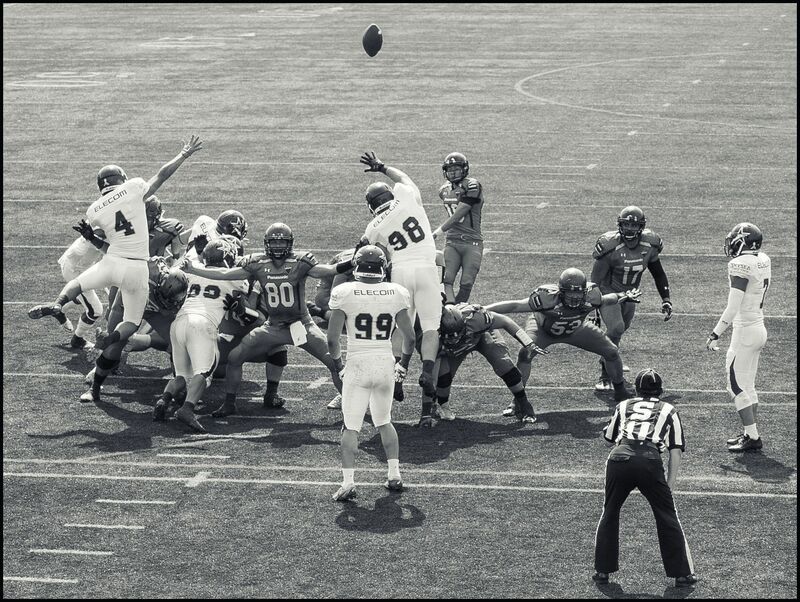 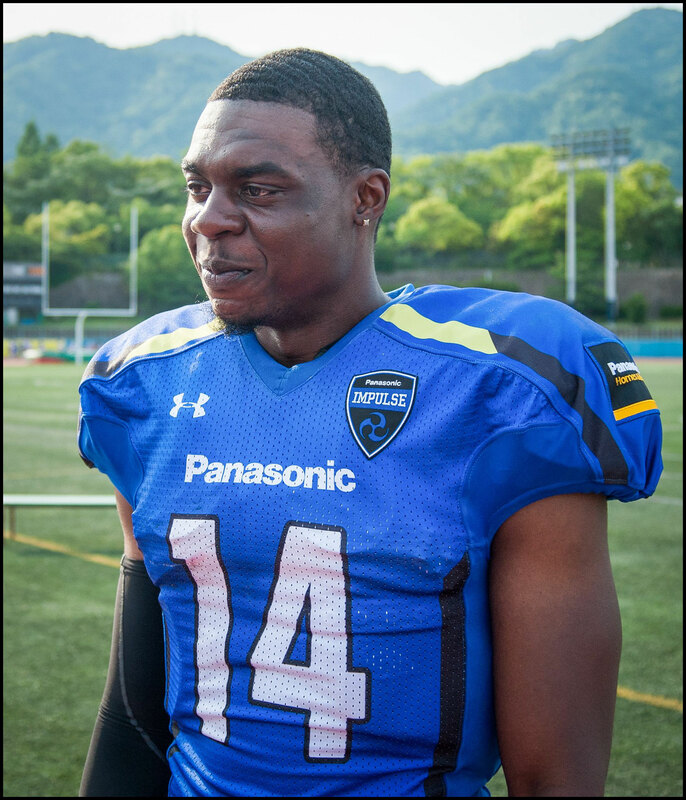 The Impulse illustrated the advantage of height at the quarterback position with American Benjamin Anderson, who stands 192cm tall, easily seeing over the line and down field. 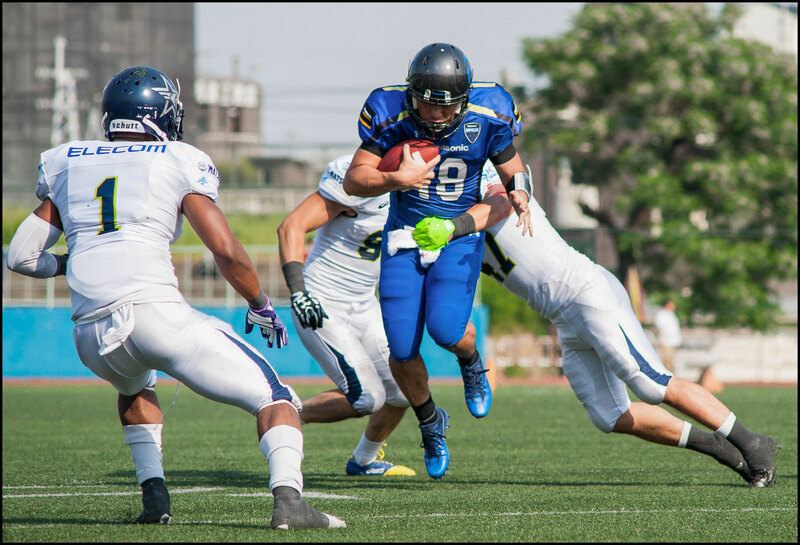 He used that advantage to connect down the middle to wide receiver Takato Kido for 44 yards and then to see an opening and take off on a 31-yard run. One play later the Impulse were in the end zone. 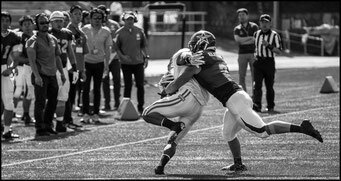 After forcing a three and out on the ensuing series, they continued the offensive show of force getting positive yards on nearly every play. 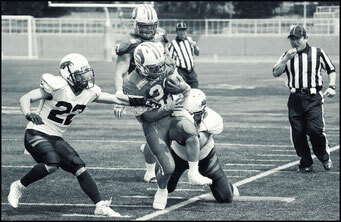 At the end of the first quarter and after just two possessions the Impulse were up by two touchdowns. The second quarter started with the Black Eagles being driven back toward their own end zone and after punting the ball, they quickly gave up another touchdown on the Impulse’s third possession. 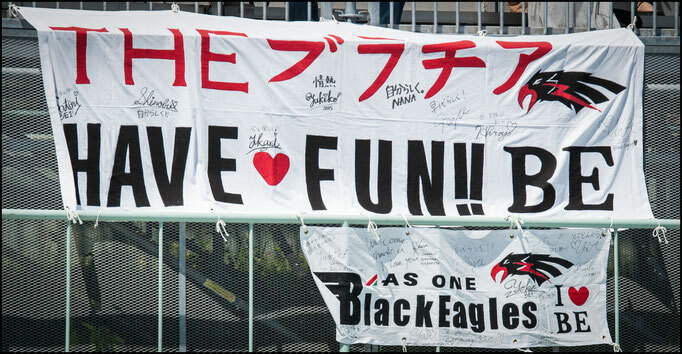 For the next four minutes the Black Eagles made a game of it. After building confidence with passes of 5, 10 and 15 yards to three different receivers, quarterback, Ryota Yabe, aired out a 49-yard TD pass to WR Hiroki Shimizu who had gotten behind his defender down the right side. 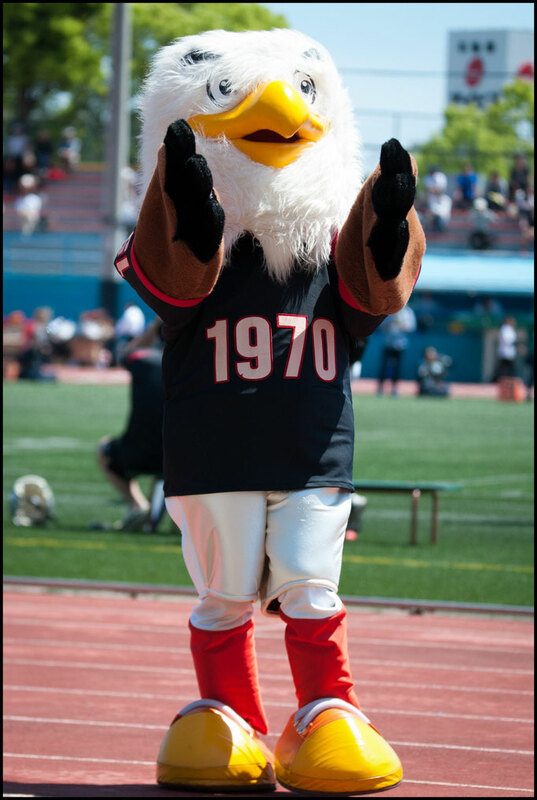 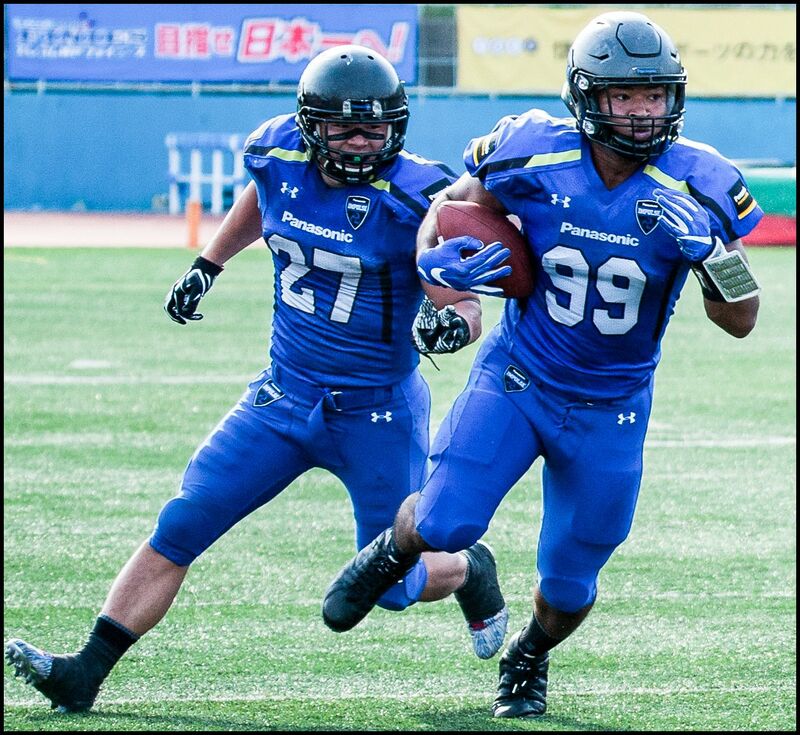 The Black Eagles Nakanishi, restarted things with a high end-over-end kick that was caught on the fly in the end zone by Emory Polley who took it out but promptly fumbled. 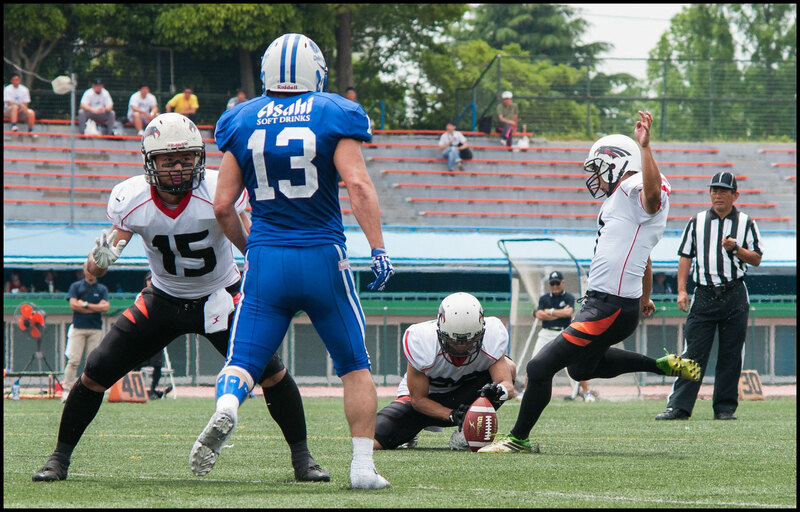 As One got the ball back on the five yard line where they could only manage a FG, but they were back in the game, down only 28-10 at halftime. 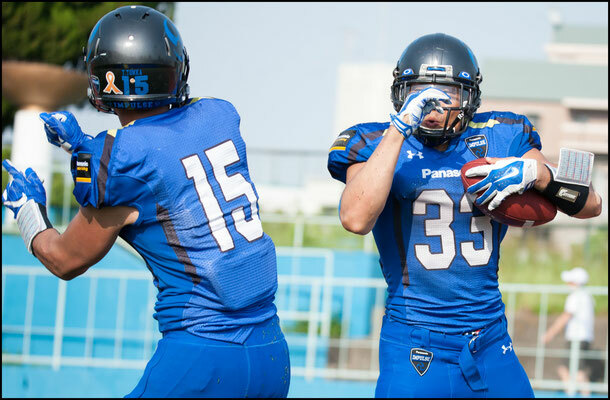 After the restart Polley redeemed himself with an 85-yard kickoff return to the five. 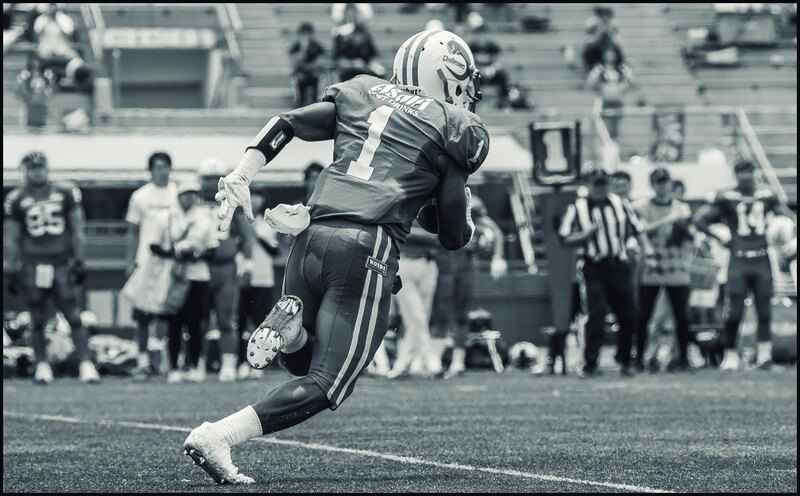 “I made a mistake but I was able to bounce back. 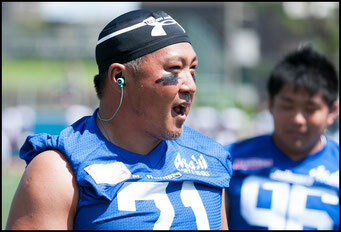 We’ve only had a few practices so I think we’ll get better.” he told Inside Sport: Japan after the game. 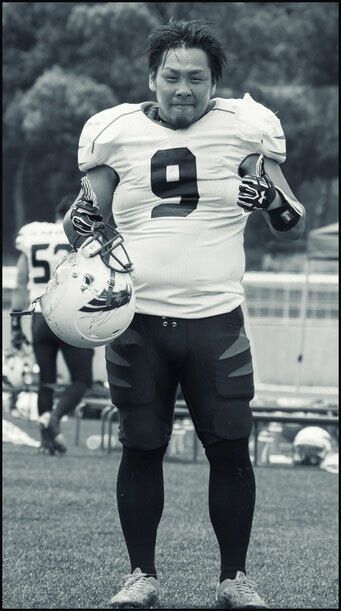 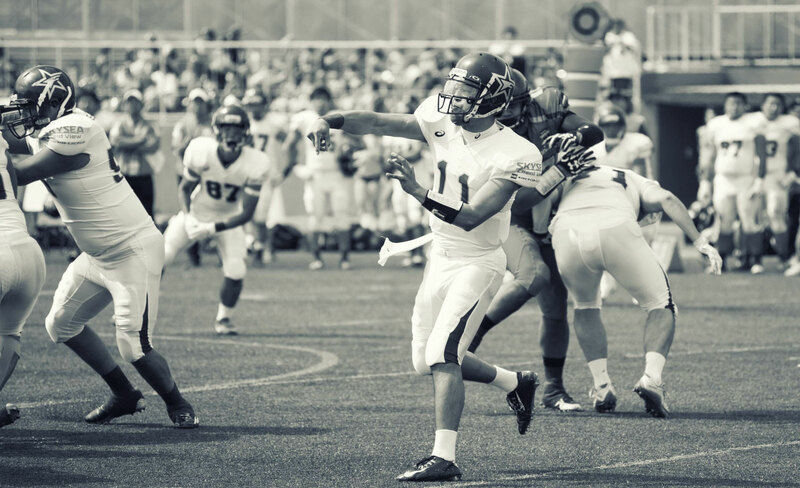 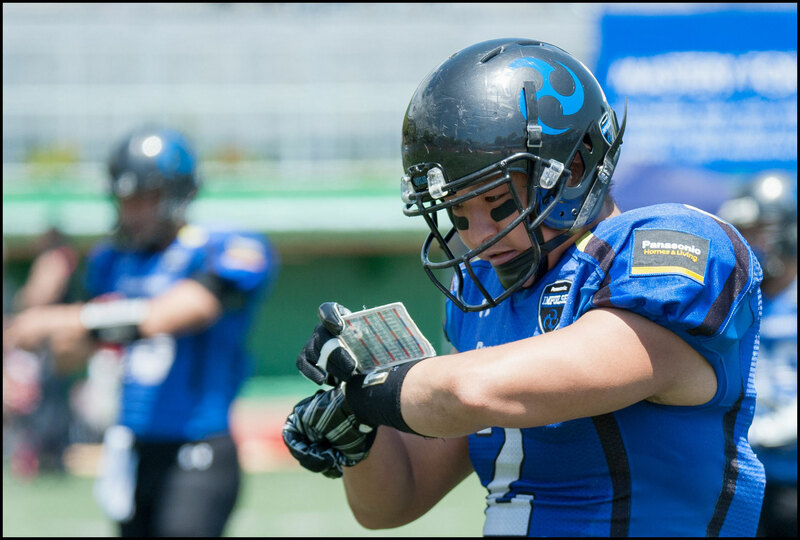 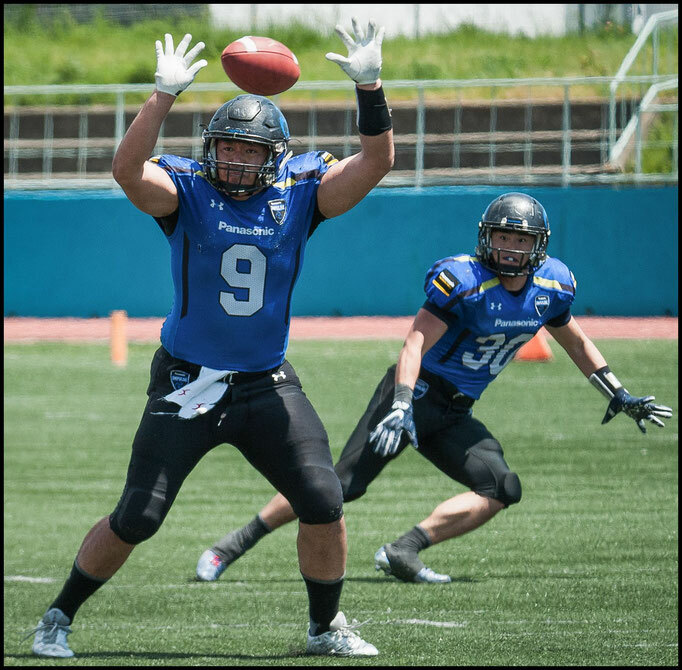 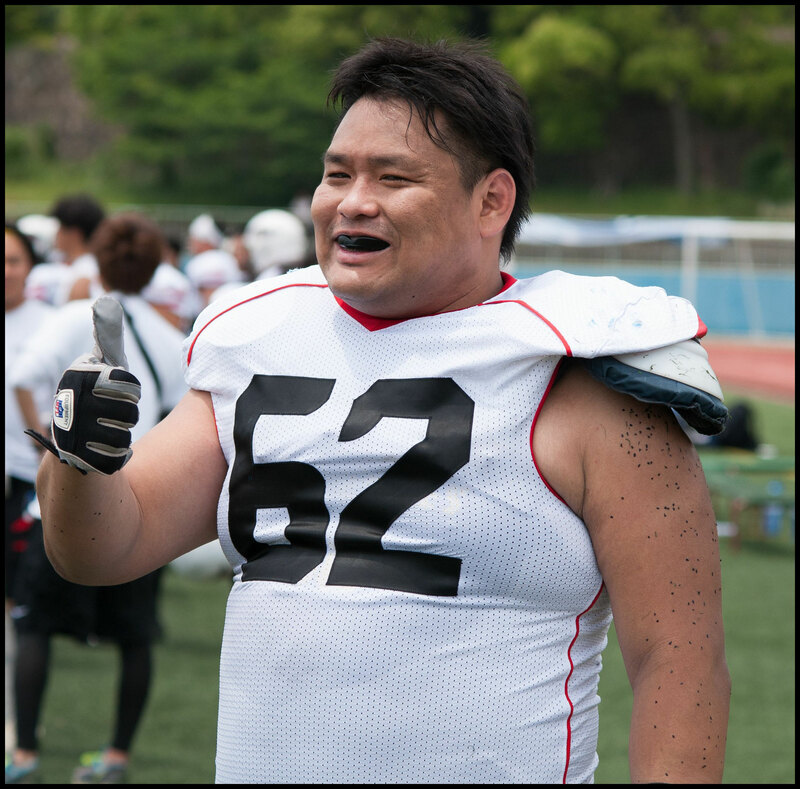 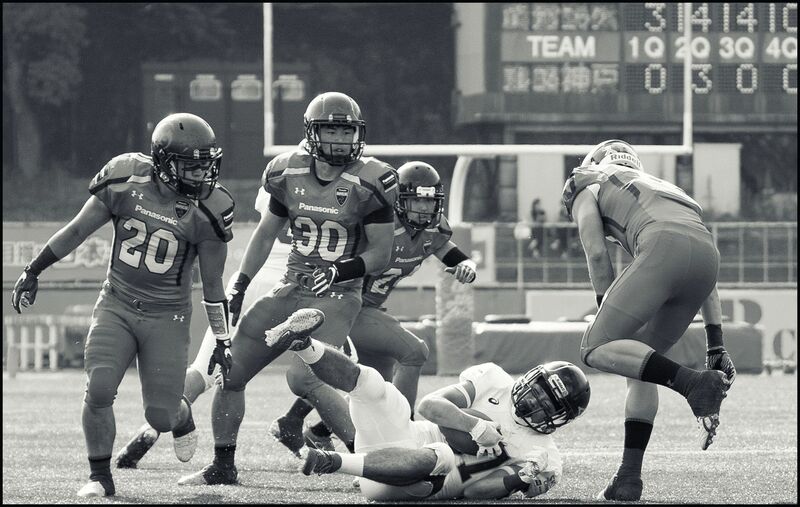 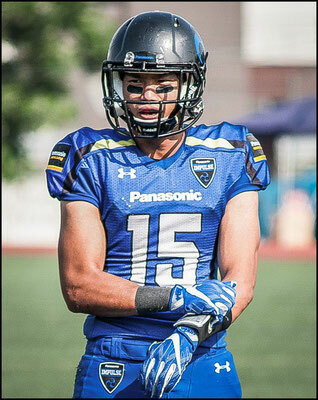 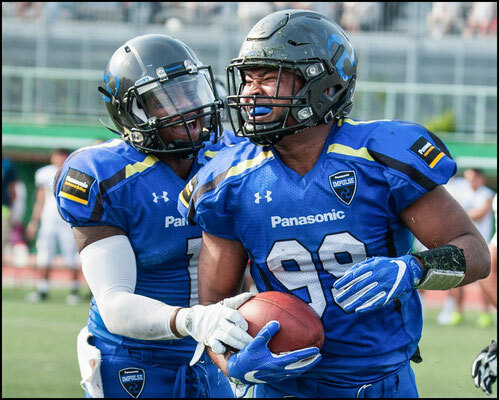 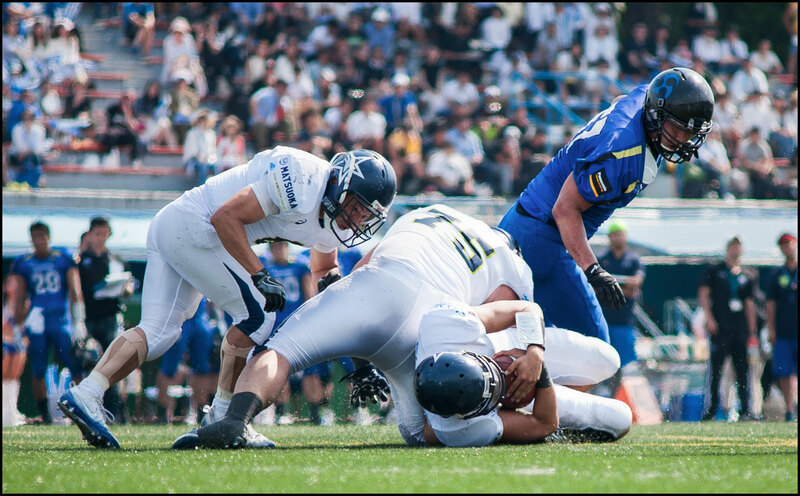 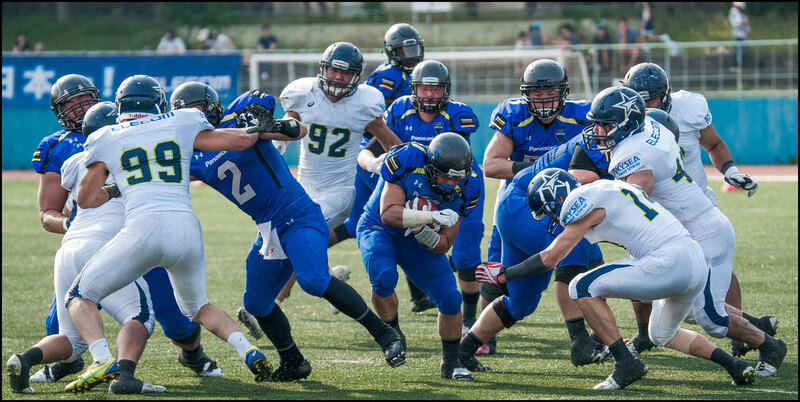 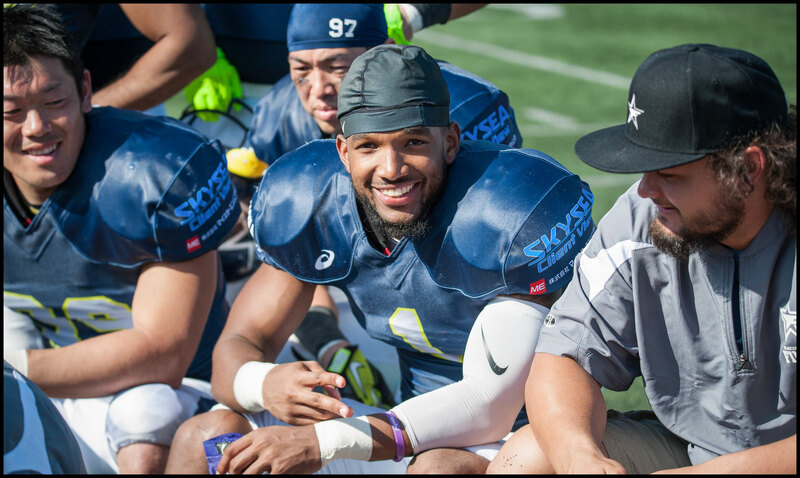 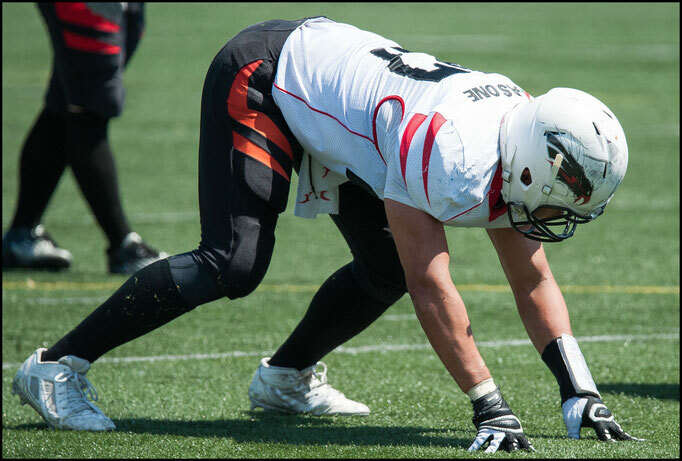 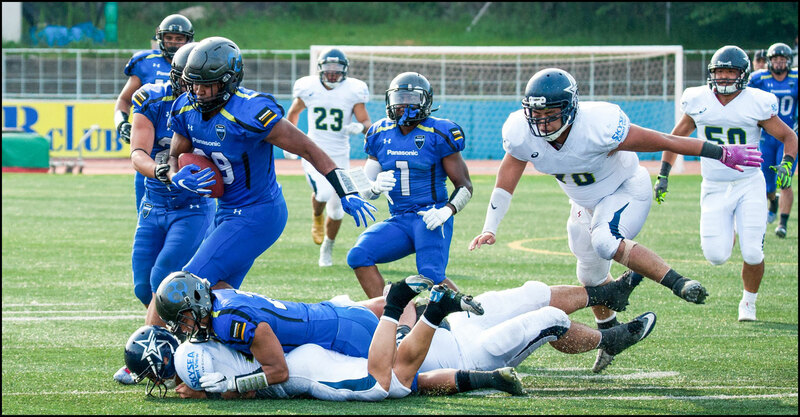 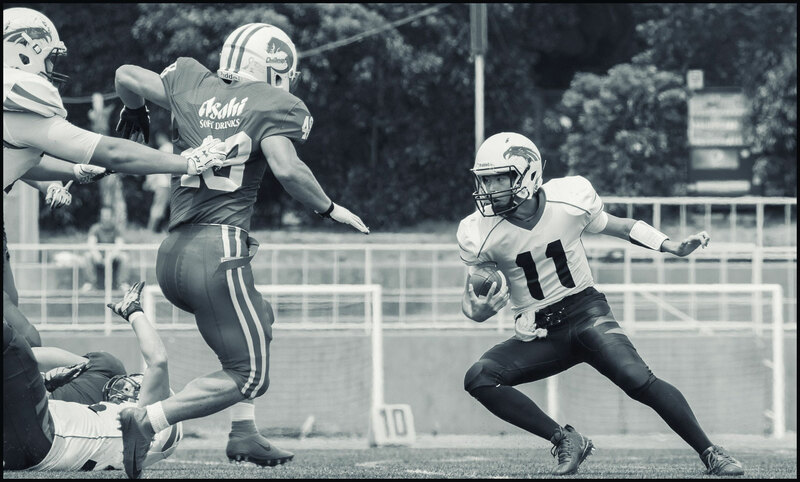 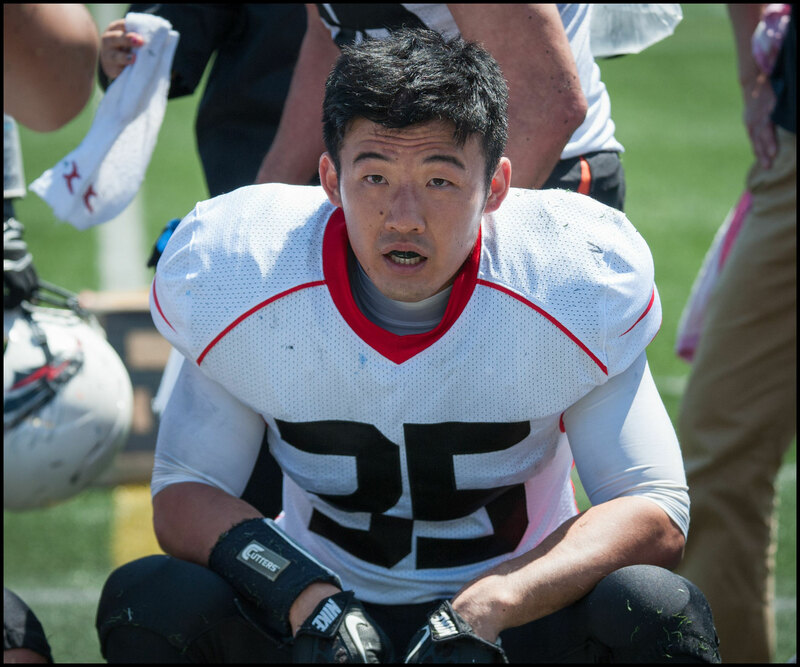 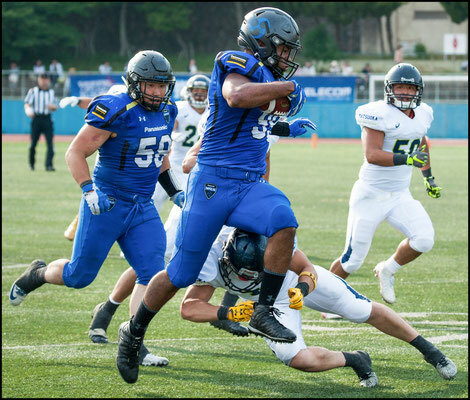 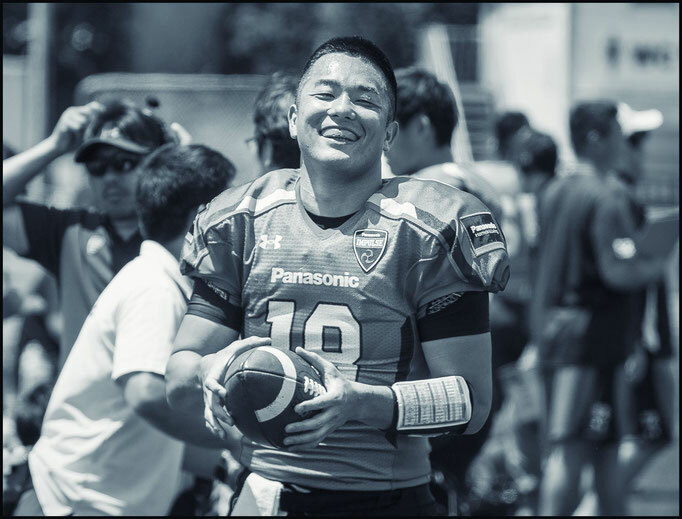 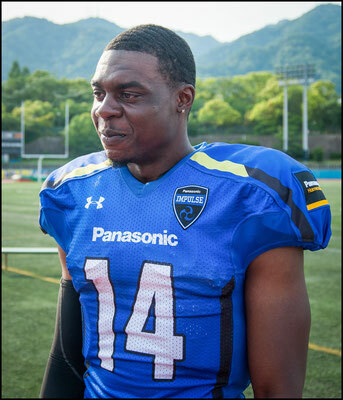 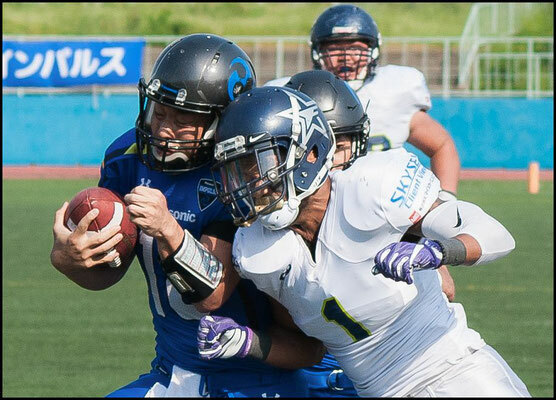 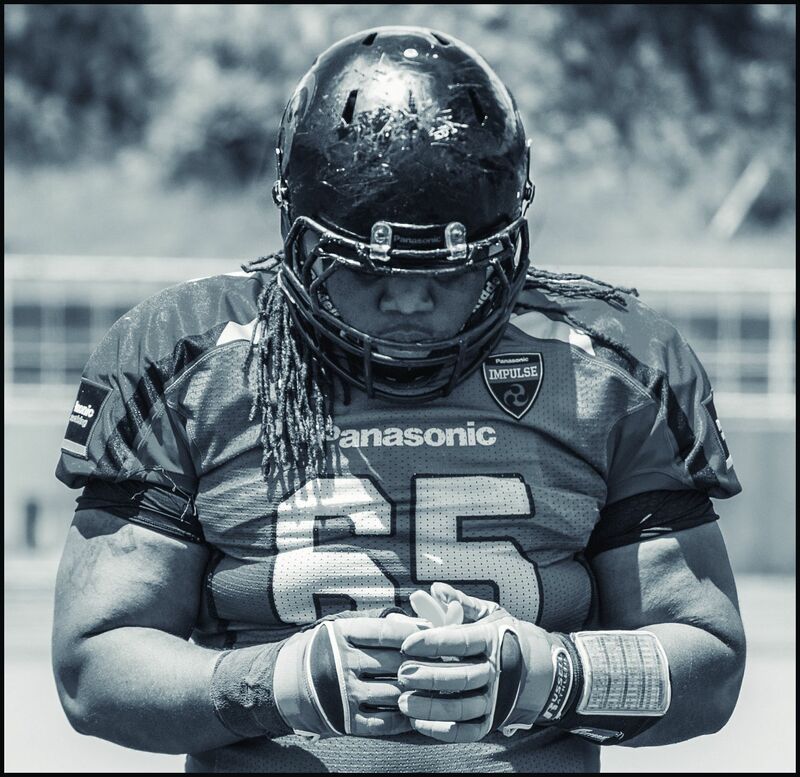 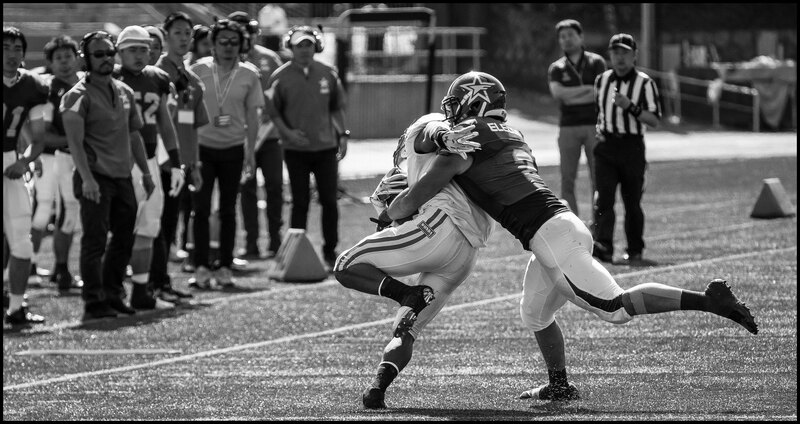 Anderson continued to dominate and Panasonic's defense overwhelmed the Black Eagles offensive line, frequently breaking though to harass quarterback Ryota Yabe. The game was already well out of reach in the fourth quarter when special teams did their part with a punt that rolled down near the goal line. 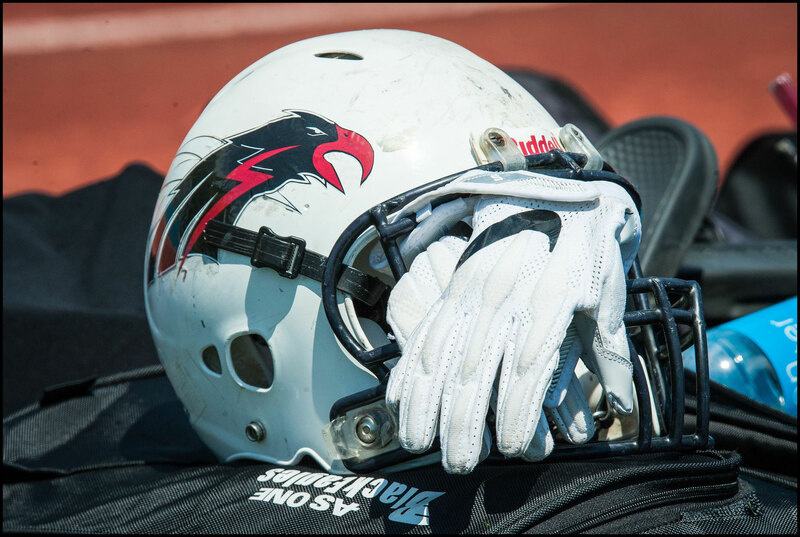 The Black Eagles kept things entertaining though by blocking an Impulse punt late in the game and then going for it on fourth down from just five yards out. 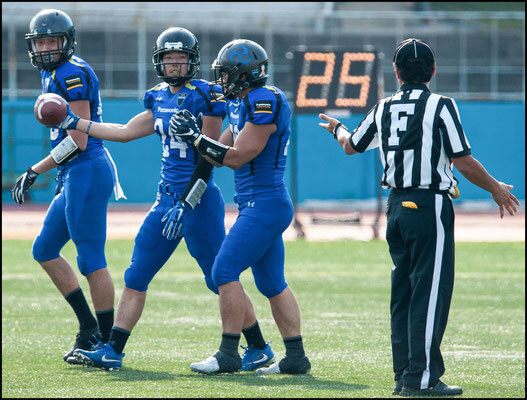 The result though was a turnover on downs with less than a minute go. 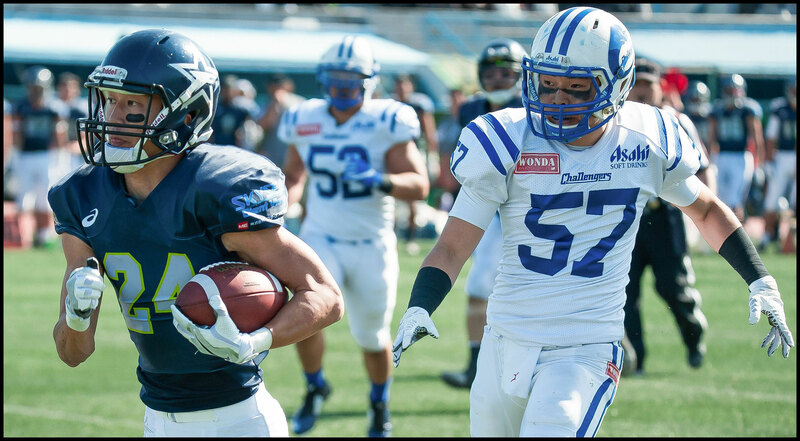 Hiroaki Suga tacked on a 91-yard run to make the final score 49-10. 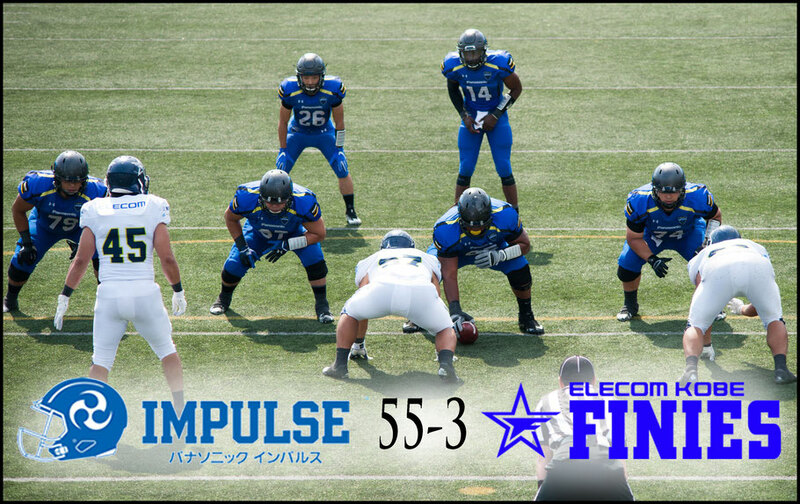 Impulse meet the Elecom Kobe Finies in the Green Bowl final at 2:30 pm on May 21. 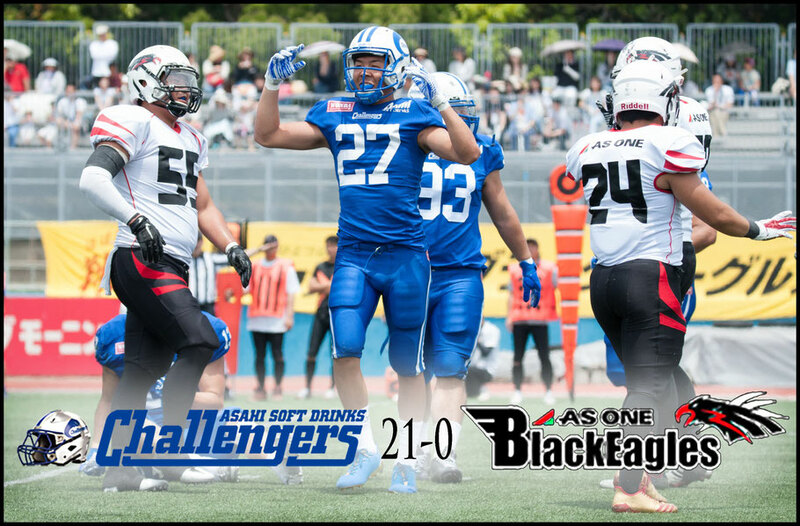 The As One Black Eagles will get a shot at third place at 11:30 am on the same day, going up against the Asahi Soft Drink Challengers. 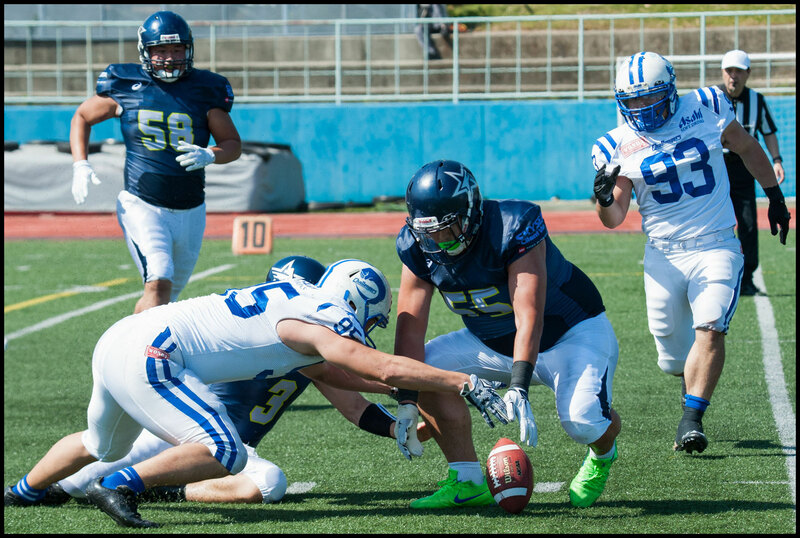 Kansai and Nagoya residents will get a first look at their XLeague teams this season when the Green Bowl and Green Bowl Challenge kick off over Golden Week. The Green Bowl is the more senior of the two competitions and features the top teams in Western Japan. All games will be at Kobe’s Oji Stadium. Four-time national champion Panasonic Impulse take on As One Black Eagles at 11:30am on May 5th and that game is followed by the more evenly matched pairing of Asahi Soft Drinks Challengers and Elecom Kobe Finies at 2:30pm. 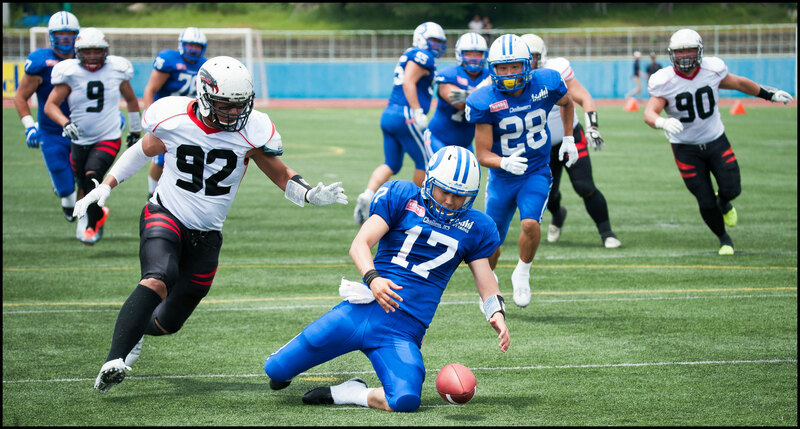 On May 21st the two losing teams will meet in the third / fourth place playoff at 11:30am and the final will be at 2:30pm. The Green Bowl, like the larger Pearl Bowl in the Kanto region, is essentially a glorified preseason tournament that takes the place of what would be mini camp in the United States. 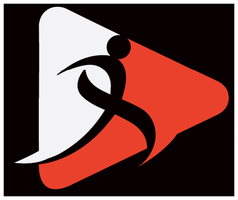 Teams place varying amounts of importance on it and the primary goal for many is getting in some live hitting and acclimatizing the new recruits. One player to keep an eye on (if he gets his visa in time to play) is Challengers new QB Alex Niznak. 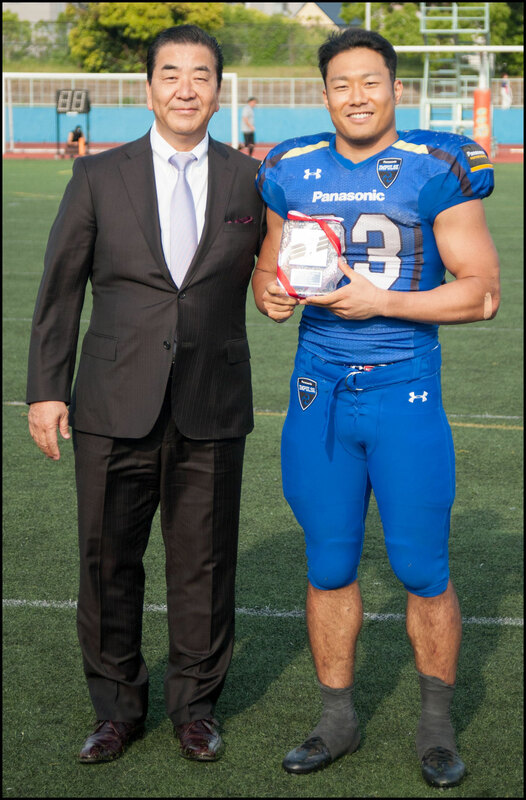 It’s the first time Asahi have had an American signal caller and it’s a sign of their intention to compete with powerful neighbor Panasonic. 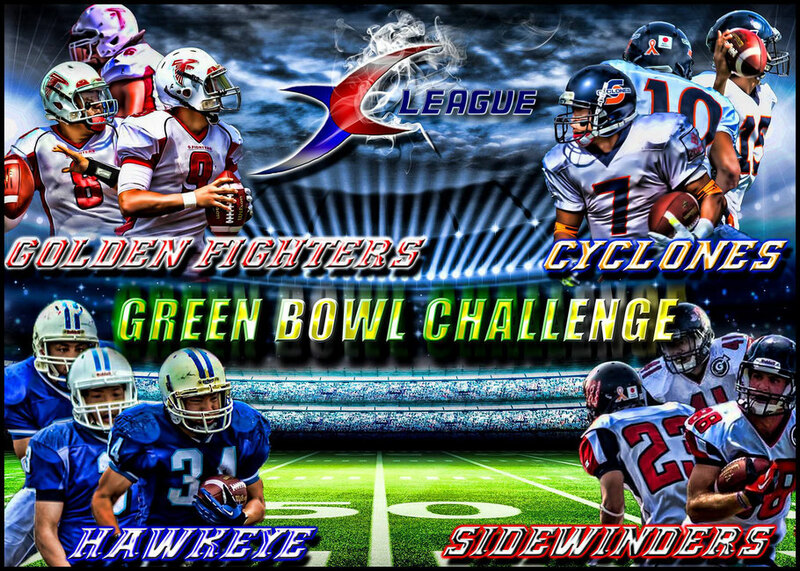 The Green Bowl Challenge features the two remaining X1 teams as well as two from the lower tier X2. On May 6th at Oji Stadium, Club Hawkeye will take on X2 side Sidewinders. 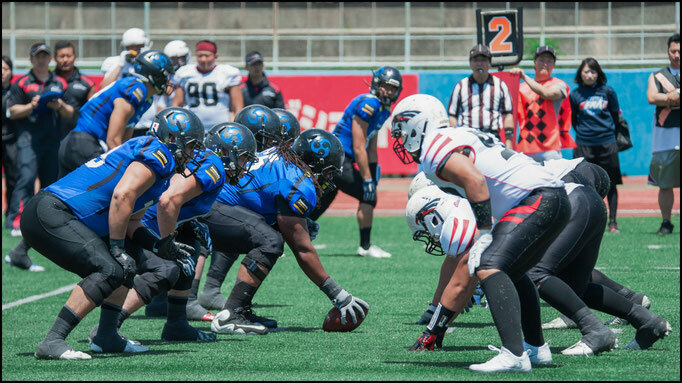 This is a rematch of last November’s promotion / relegation playoff that saw Hawkeye win on a late FG to become the only X2 team to gain promotion to X1. 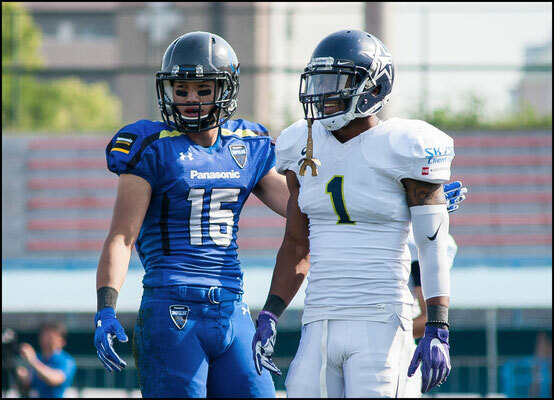 Sidewinders will no doubt be out for revenge there. 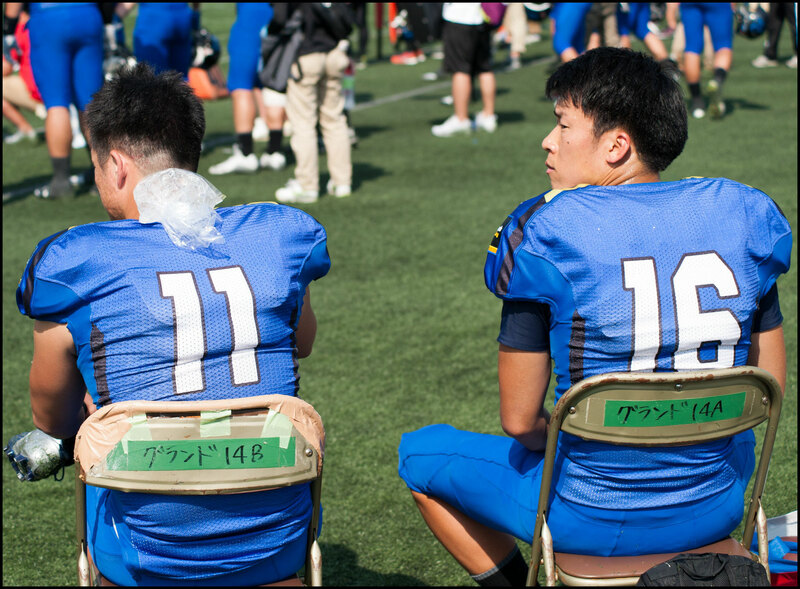 That game is at 11:30am. 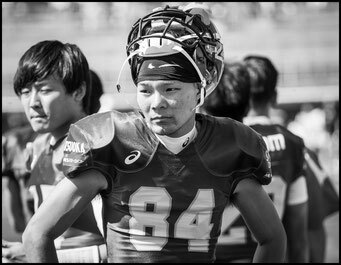 The same day the only game in either competition not in Kobe sees Nagoya Cyclones take on X2 side Golden Fighters at Nagoya City Minato Soccer Stadium. Kickoff is at 2pm. 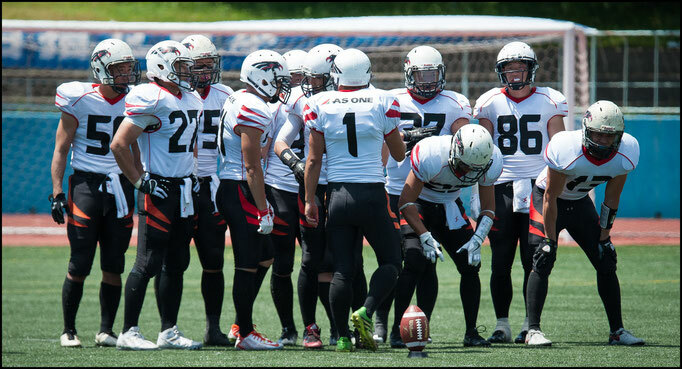 All four teams will be at Oji stadium on May 20th for the final round of games. 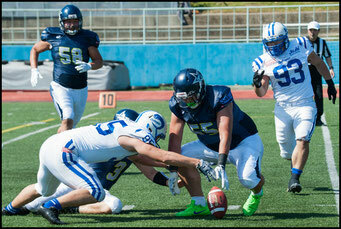 As with the Green Bowl the third / fourth place playoff is first up (at 11am) followed by the final at 1:40pm. 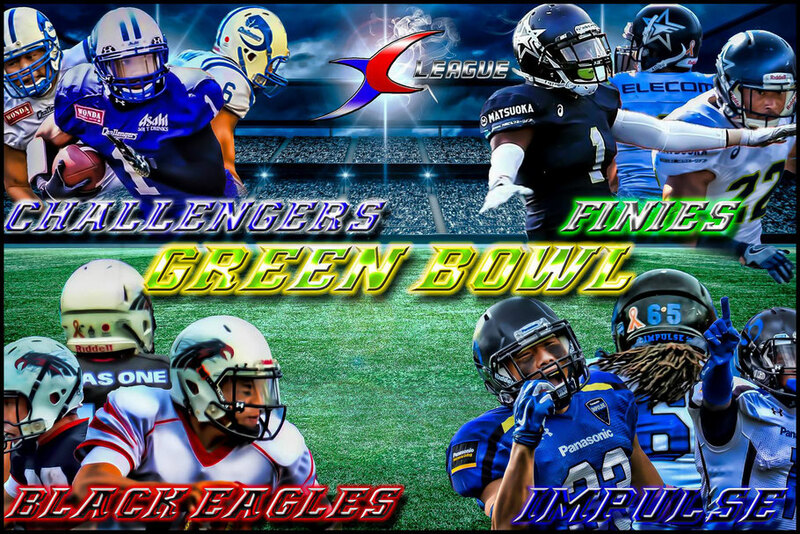 The Green Bowl and Green Bowl Challenge will be the only matchups of XLeague teams in Kansai or Nagoya until the regular season starts in the autumn so if you want to see some top tier football make sure you get alone to a game.